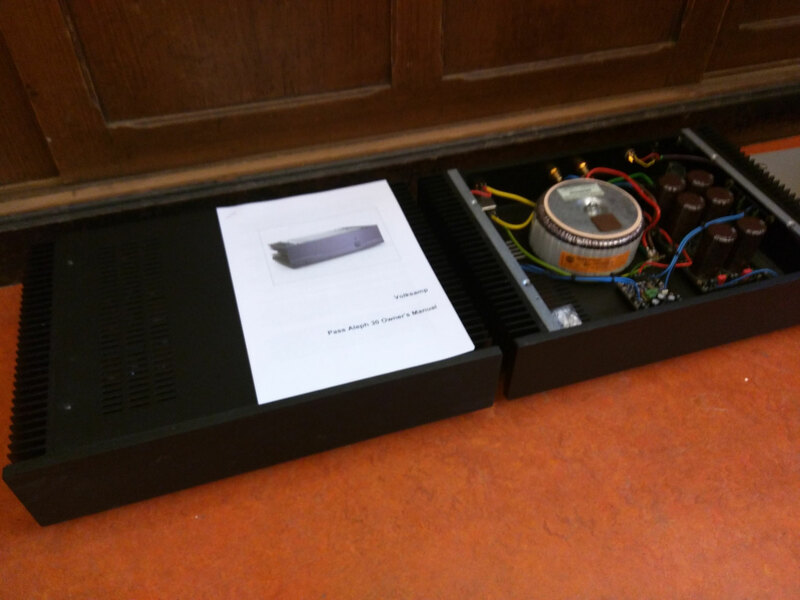 Functionality: Stereo power-amplifier. 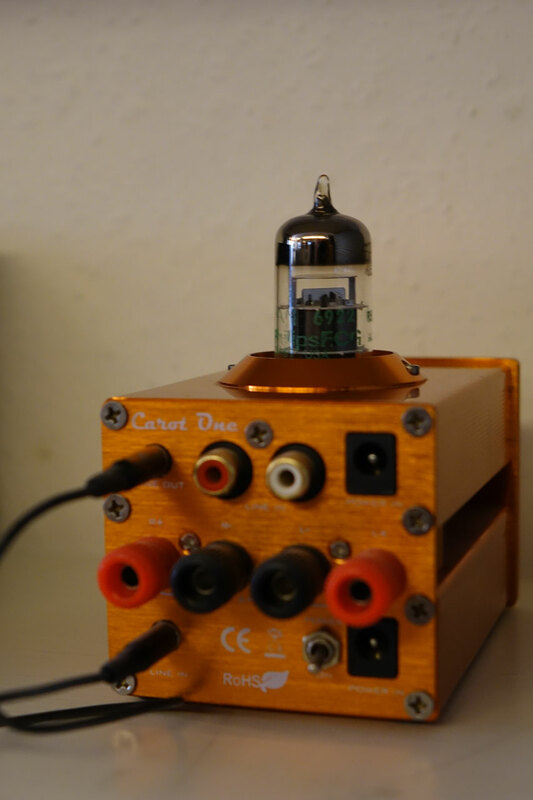 Rated output: 2 channels at 200W into 8Ω, or 1 channels at >650W into 8Ω (bridge mode), ~1000W into 4Ω. 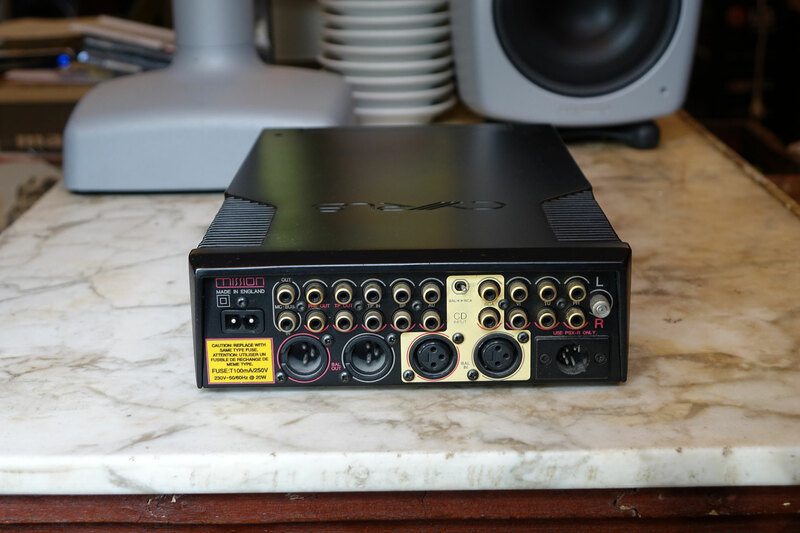 Inputs: Balanced on XLR-3F connectors and unbalanced on RCA. 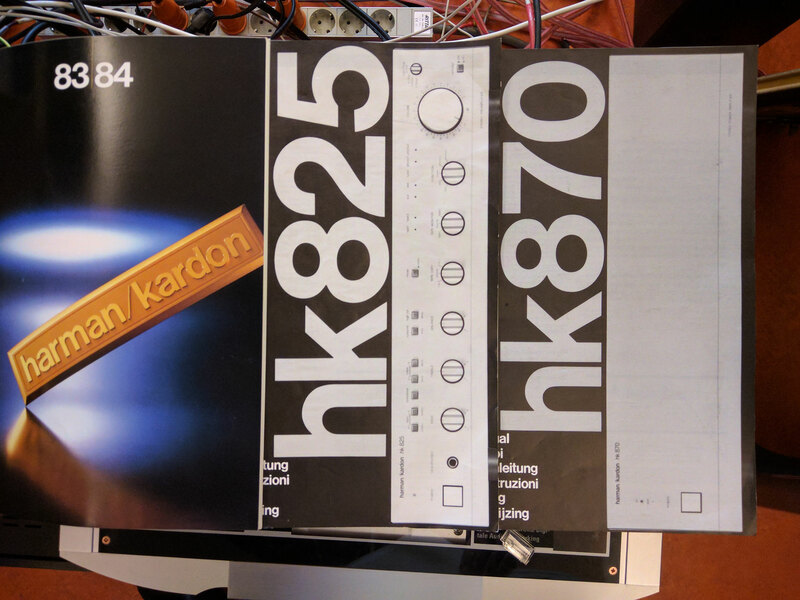 Accessories: all accessories, including original packaging and manual. 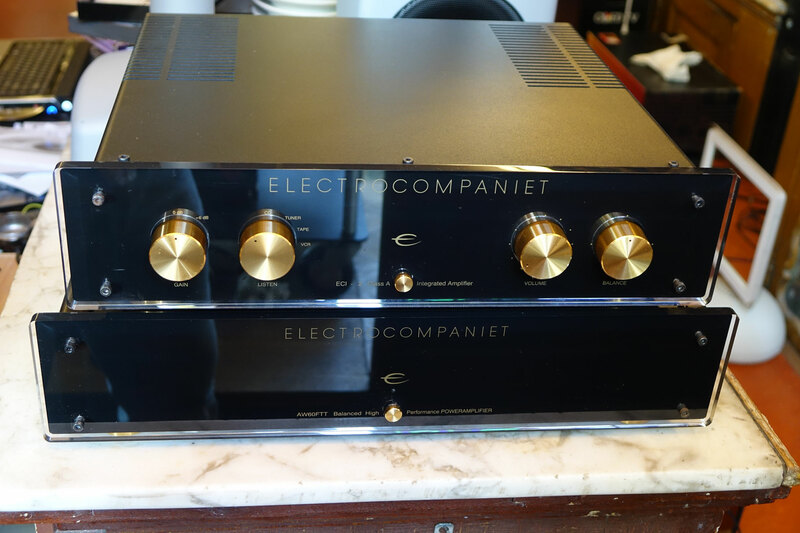 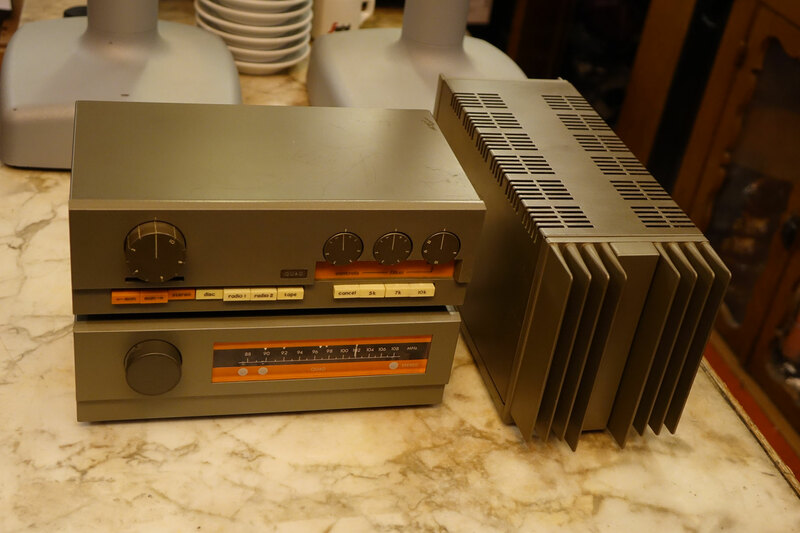 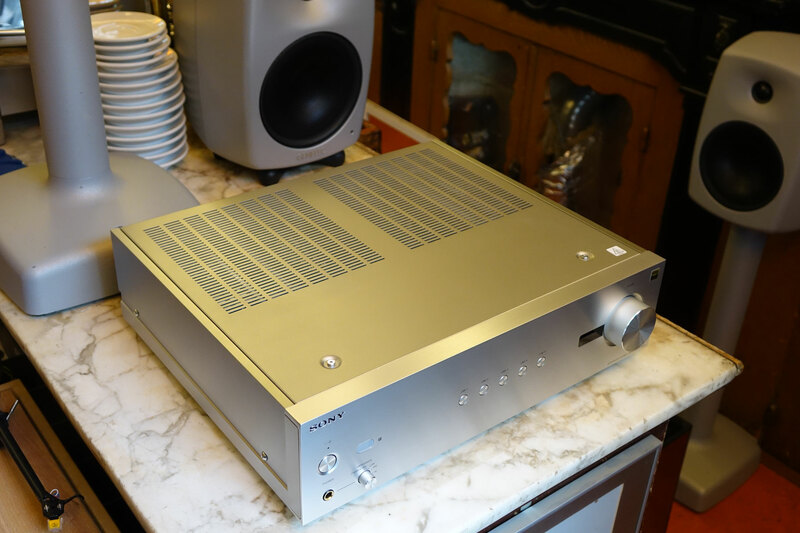 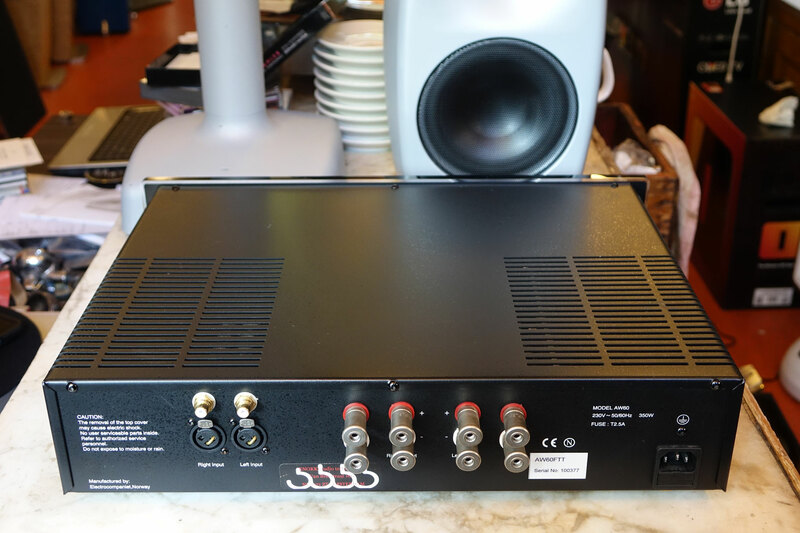 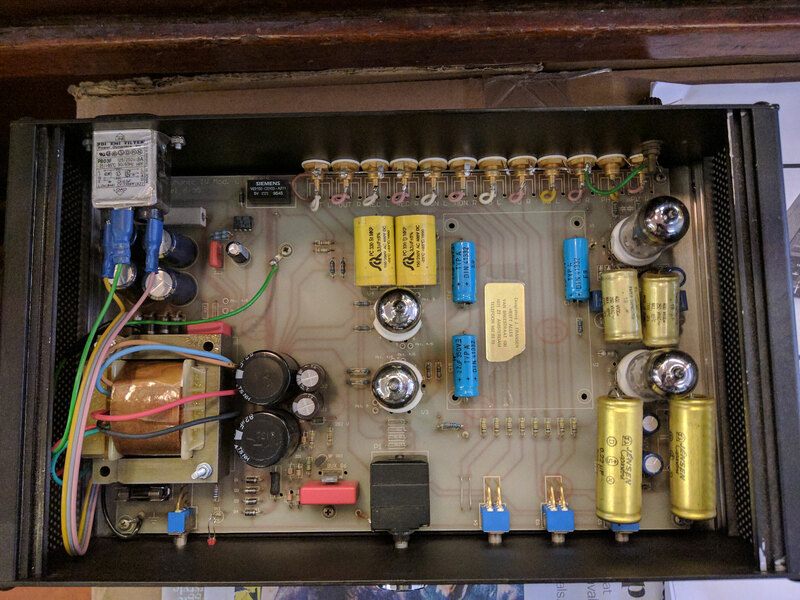 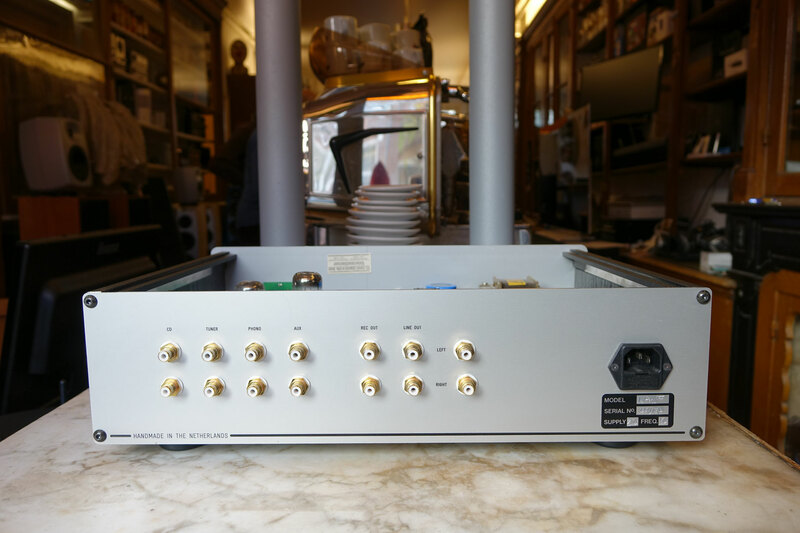 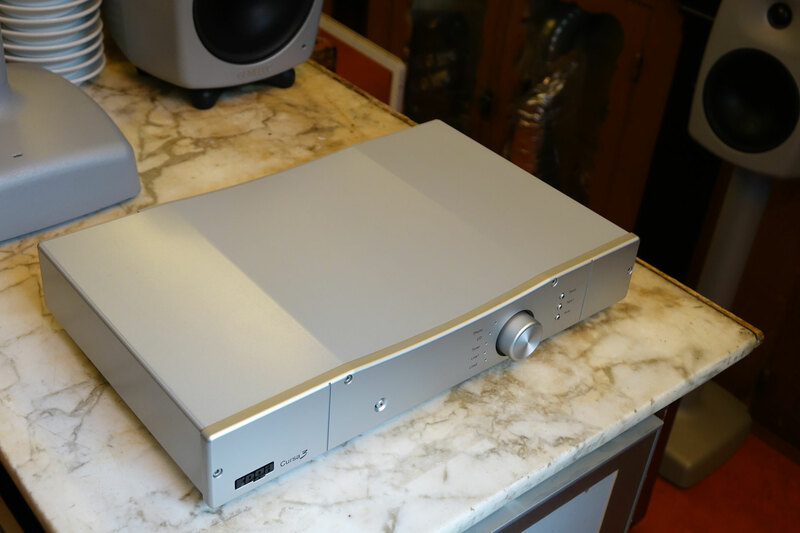 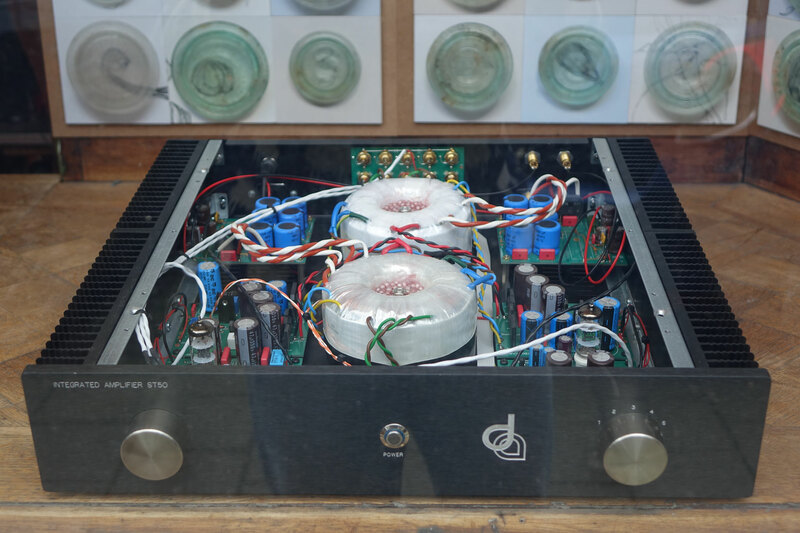 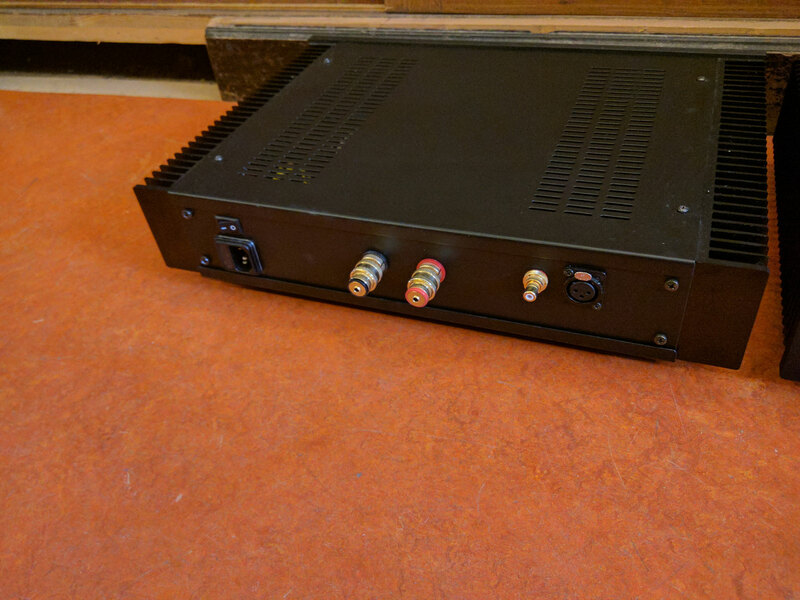 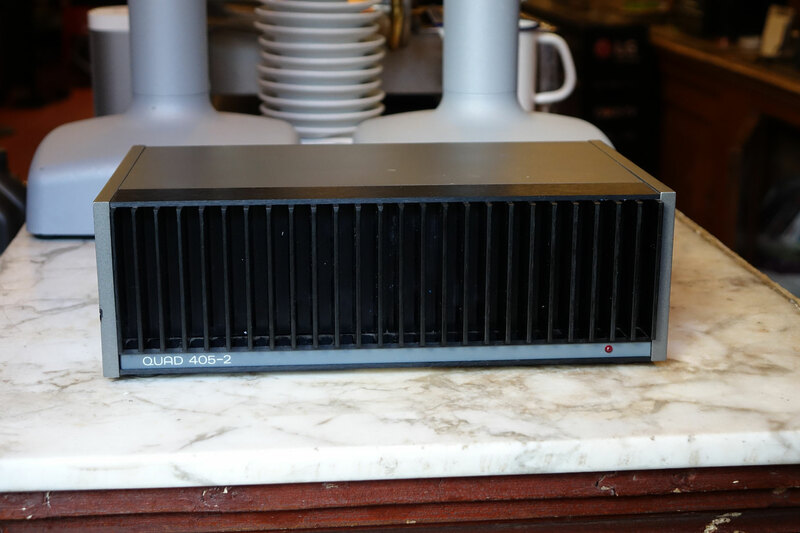 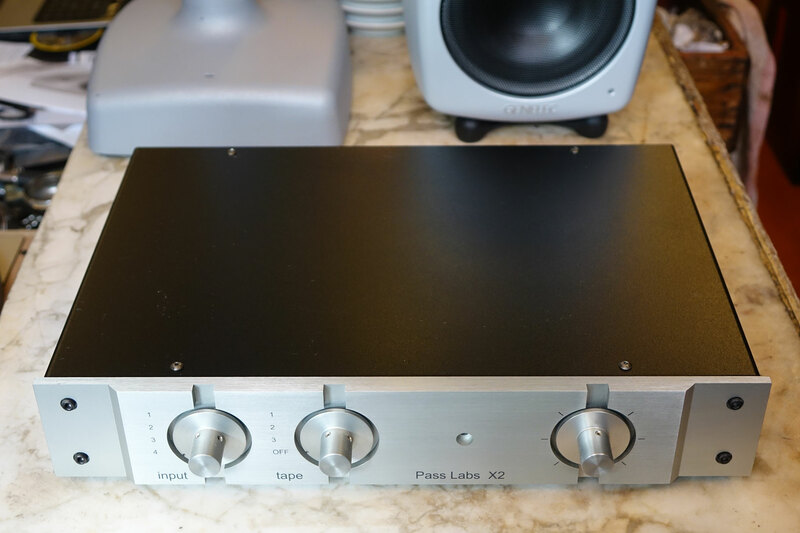 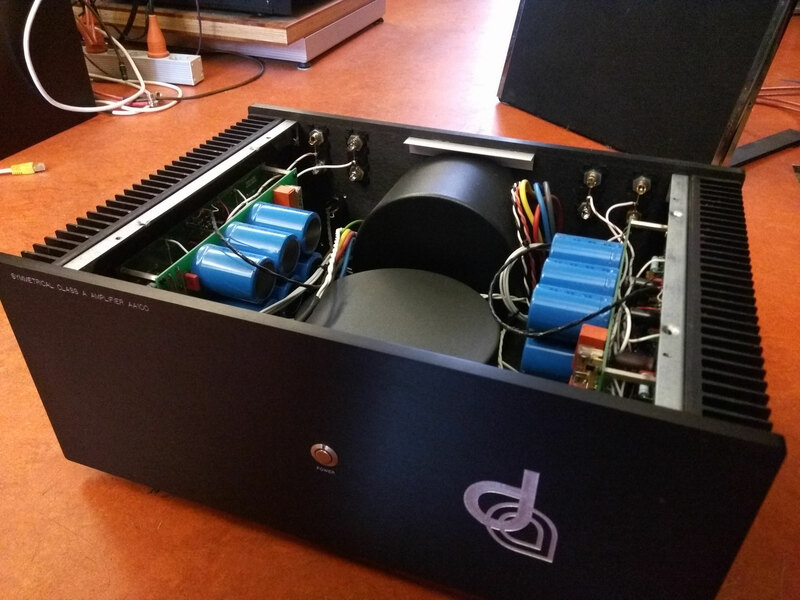 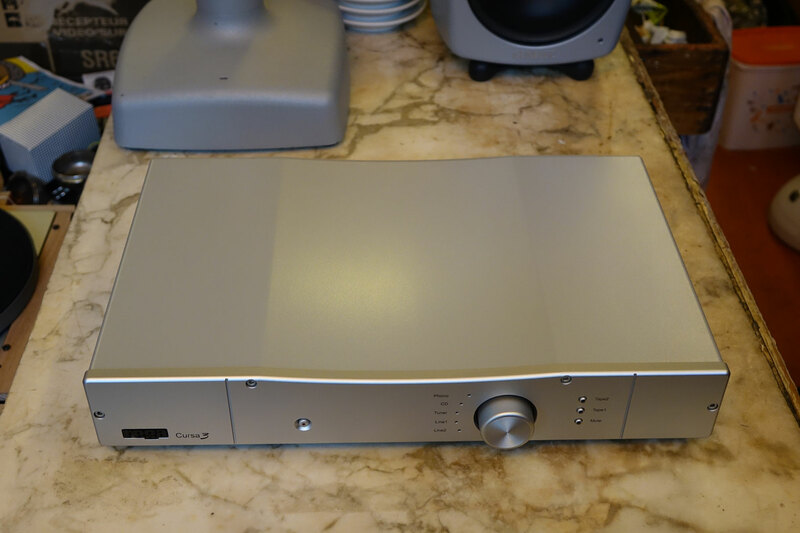 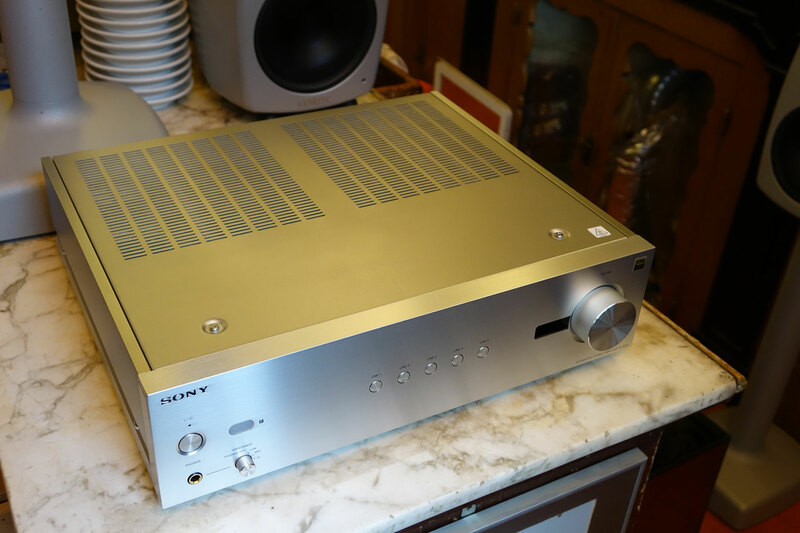 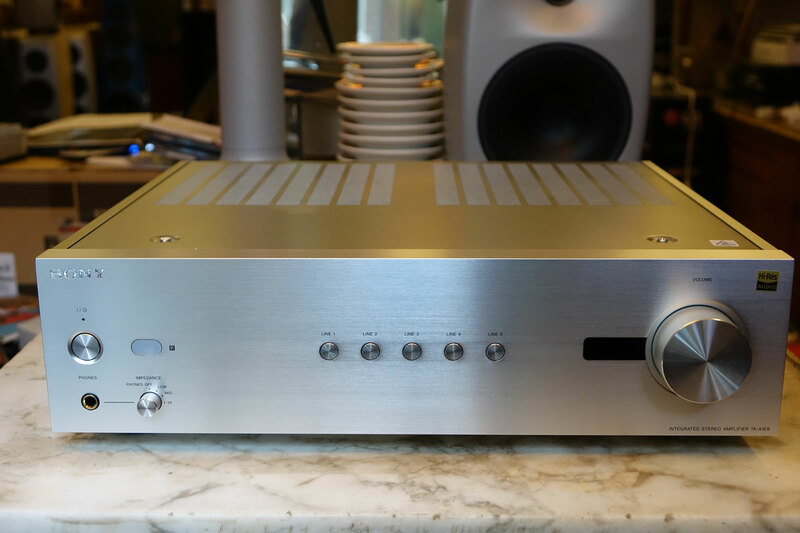 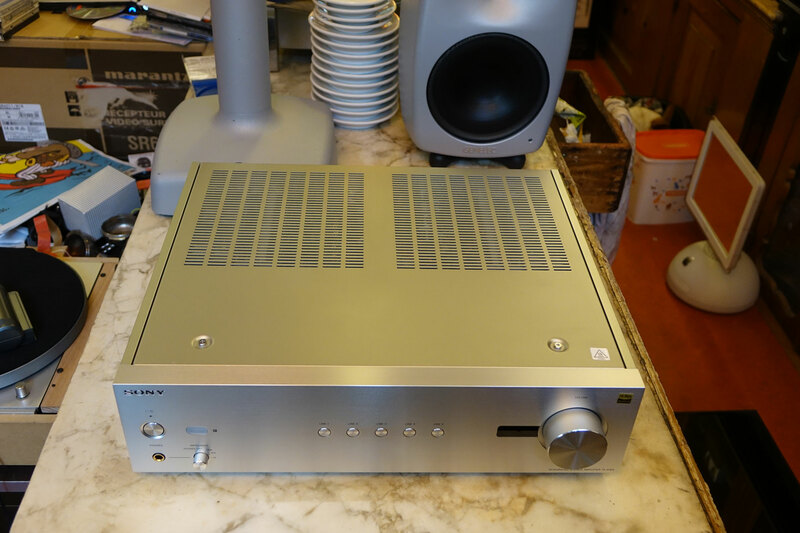 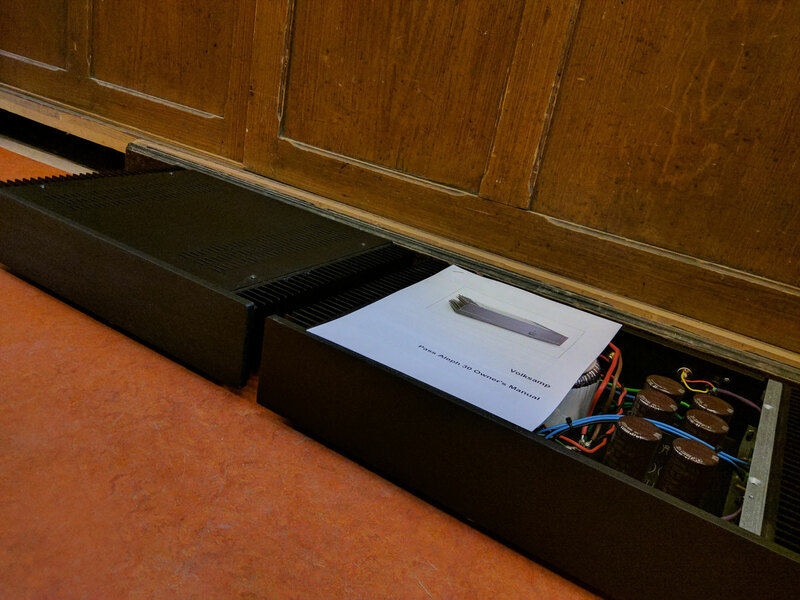 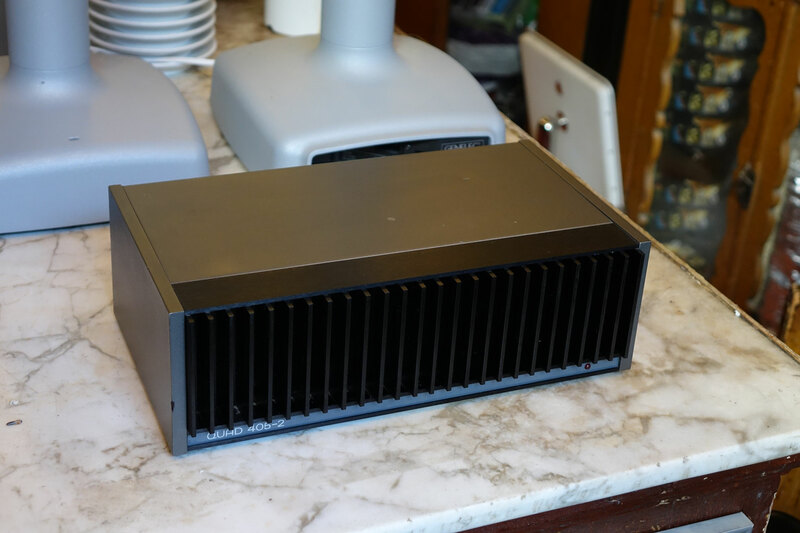 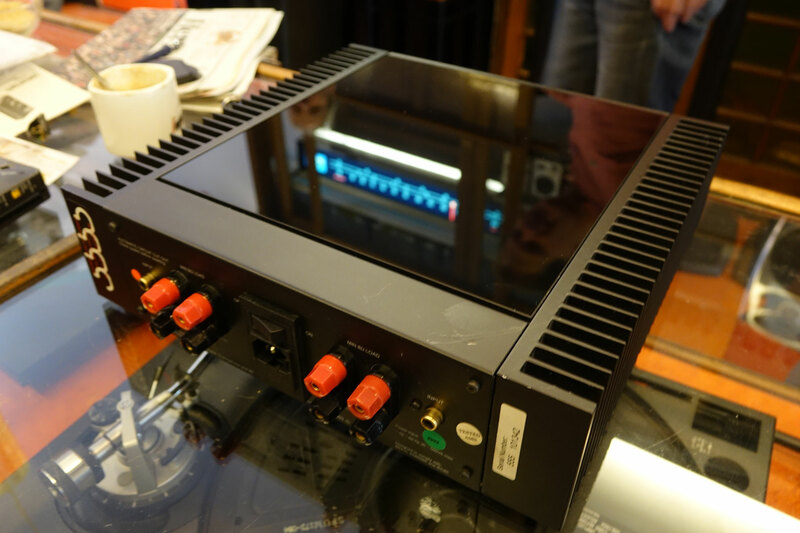 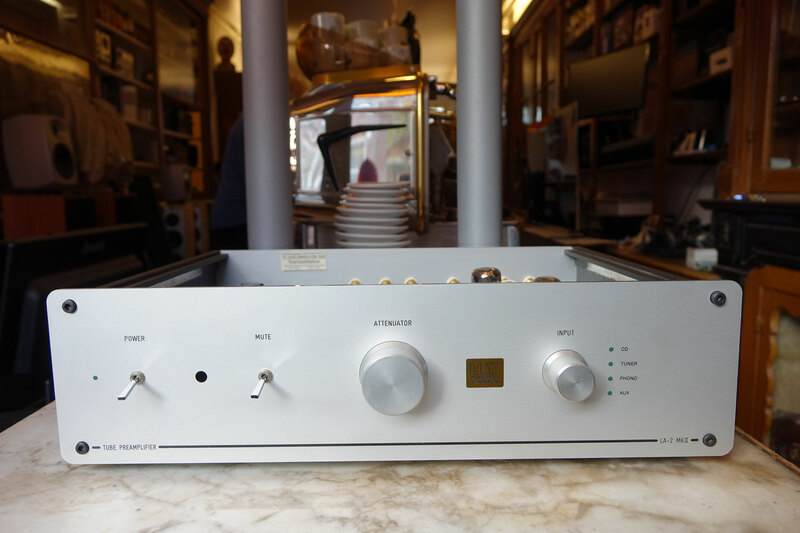 Description: Integrated amplifier. 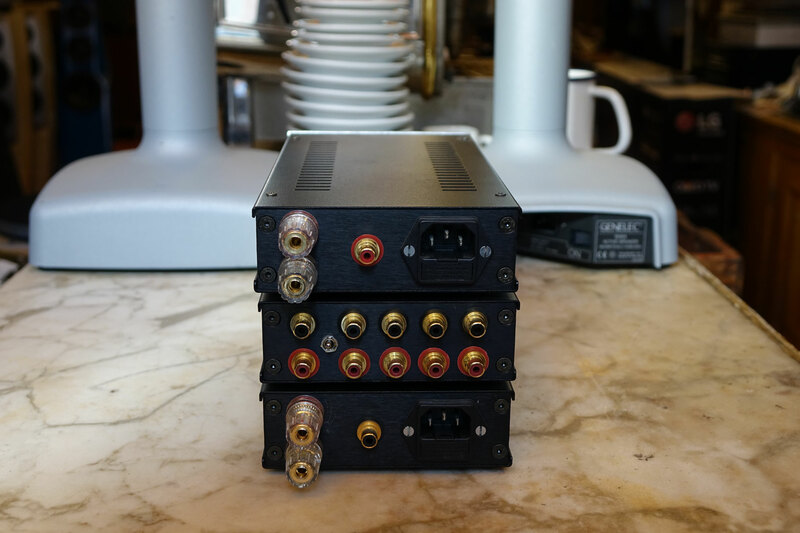 Inputs: 5x line-level (4x RCA, 1x XLR). 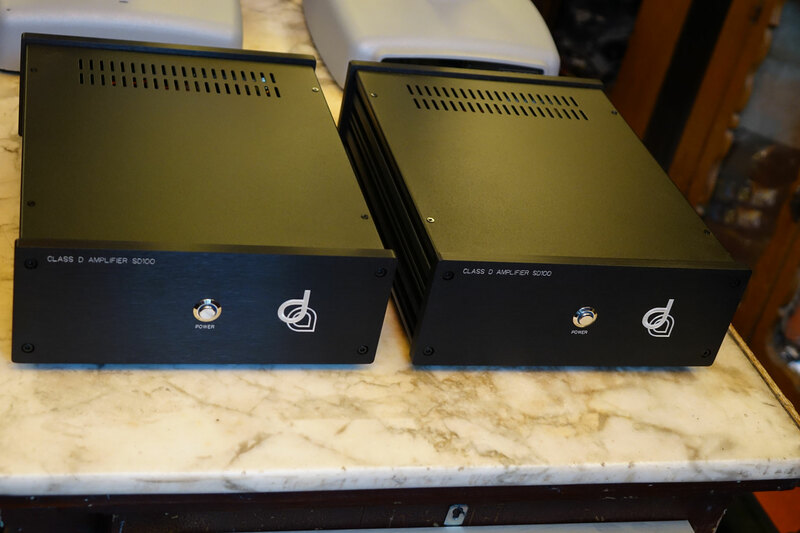 Outputs: 2x 80 W single wire binding posts. 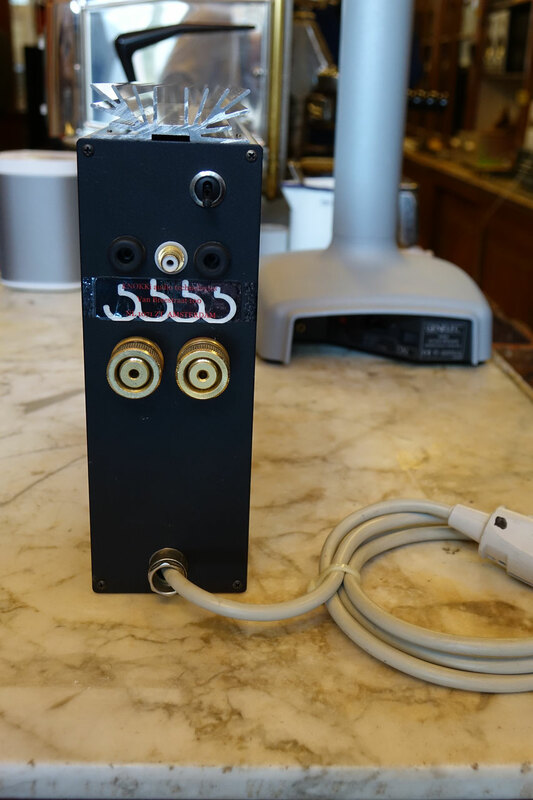 1x frontpanel headphone socked with adjustable impedance. 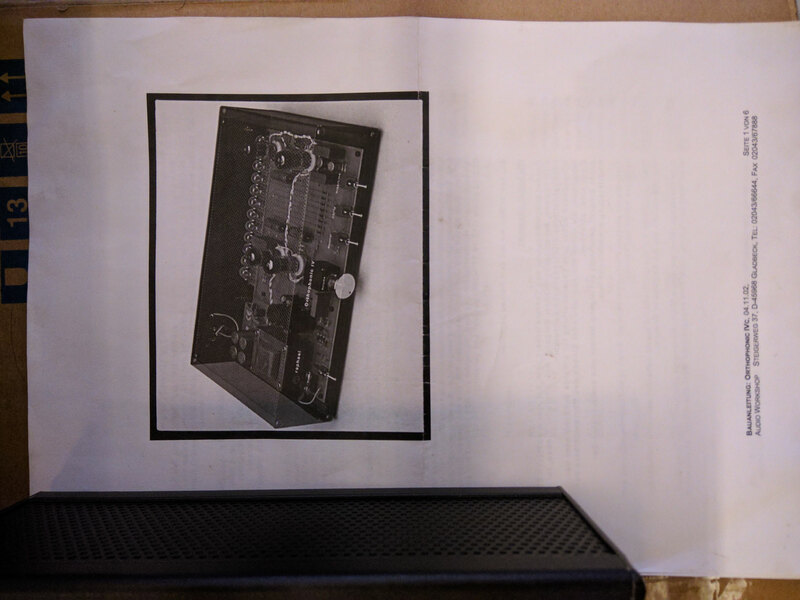 Accessories: All original accessories, including remote and original packaging. 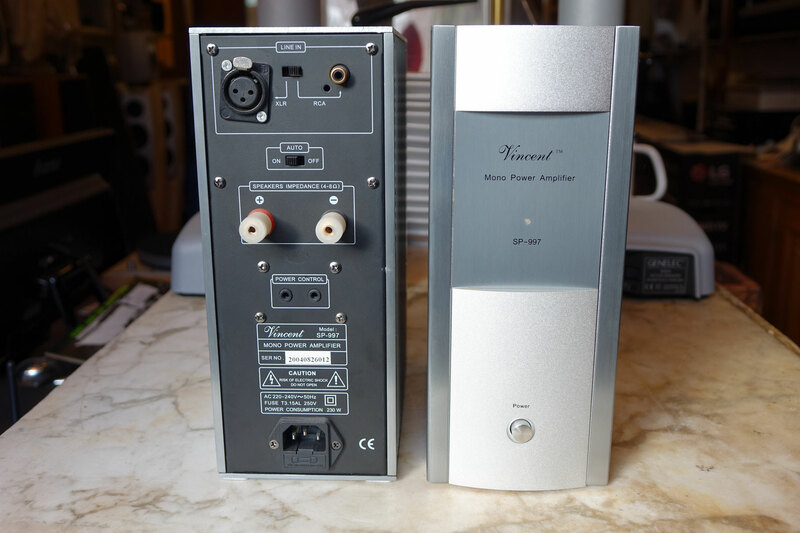 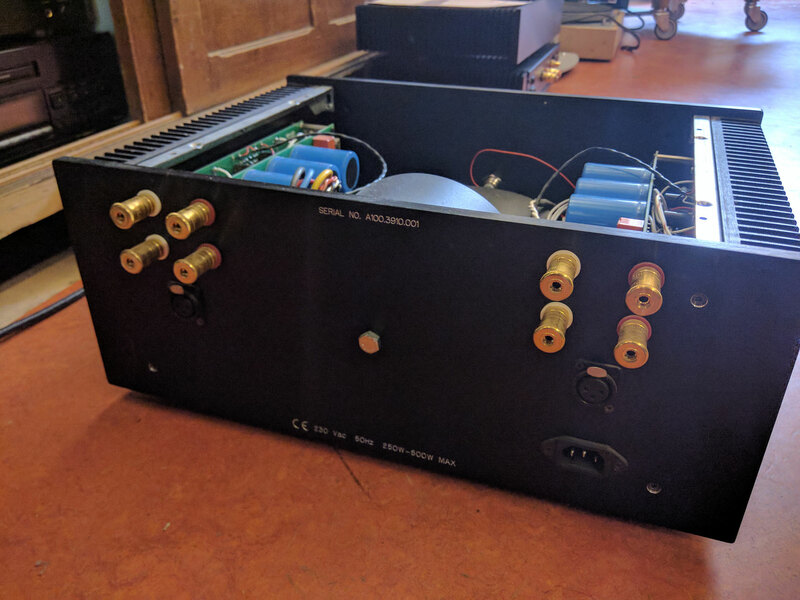 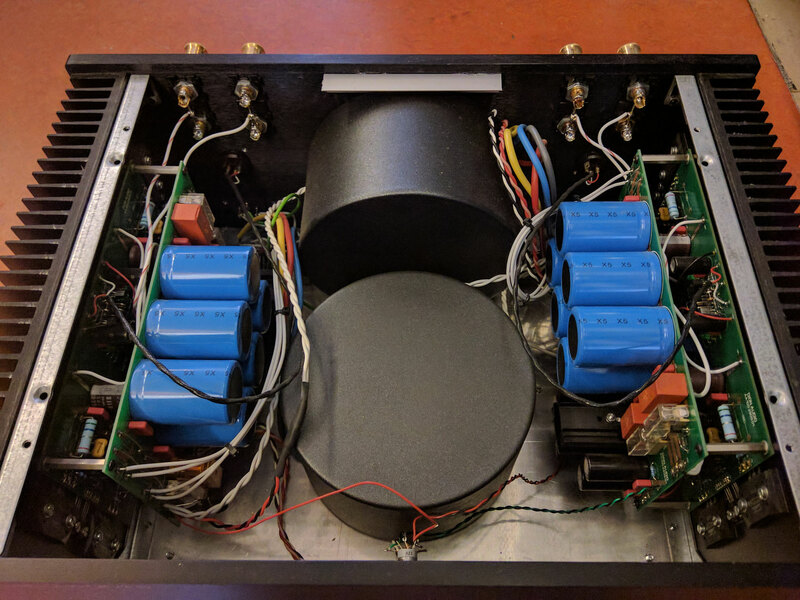 Slew rate - 700V/mS (input filter bypassed), Sensitivity (RCA input) - 380mV (for 50W stereo into 8 Ohms), Sensitivity (BAL input) - 775mV (for 50W stereo into 8 Ohms). 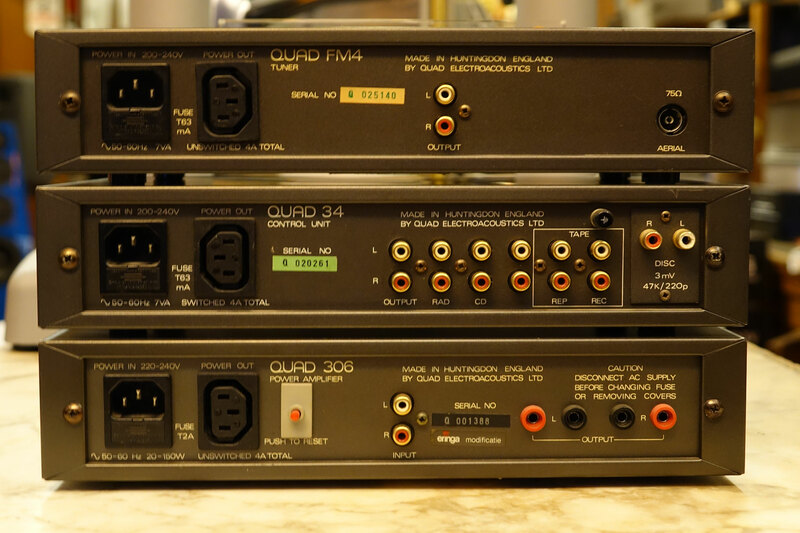 Input impedance - 10Kohm (RCA), 22Kohm (BAL), Output voltage - 380mV (Chain out). 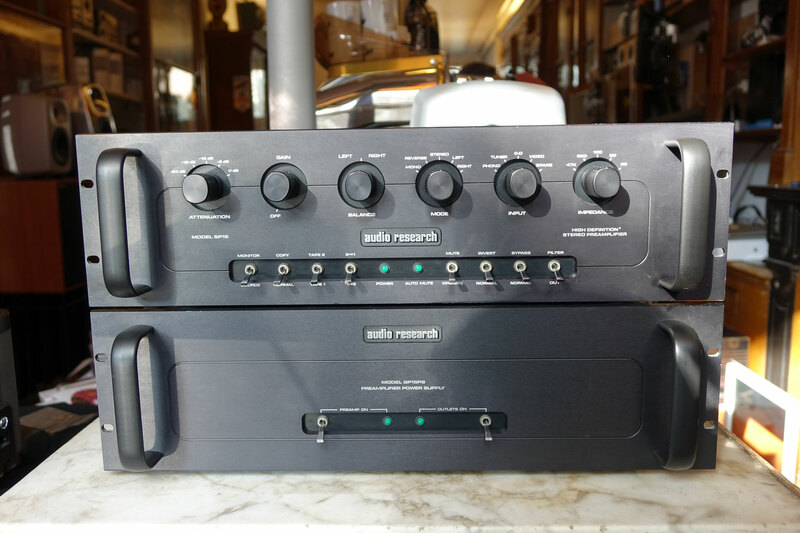 S/N Ratio - 110dBA. 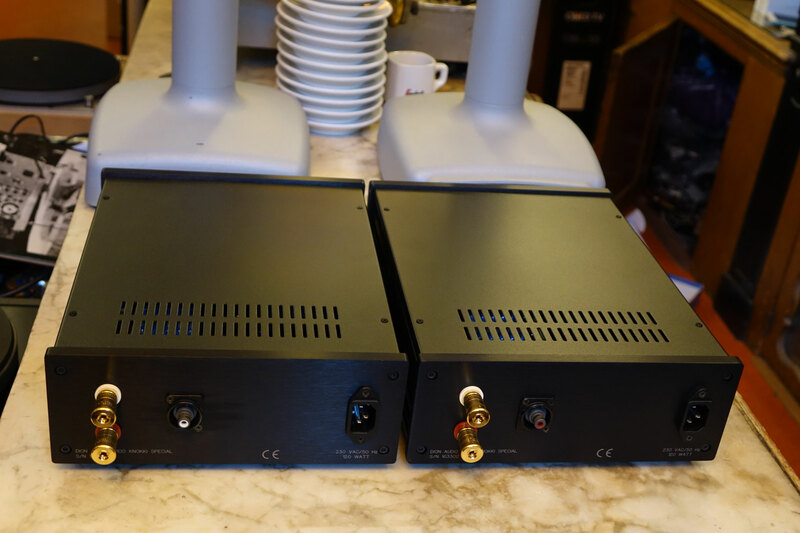 Dimensions - (H x W x D) 73 x 215 x 360 (mm), Weight - 4.6kg. 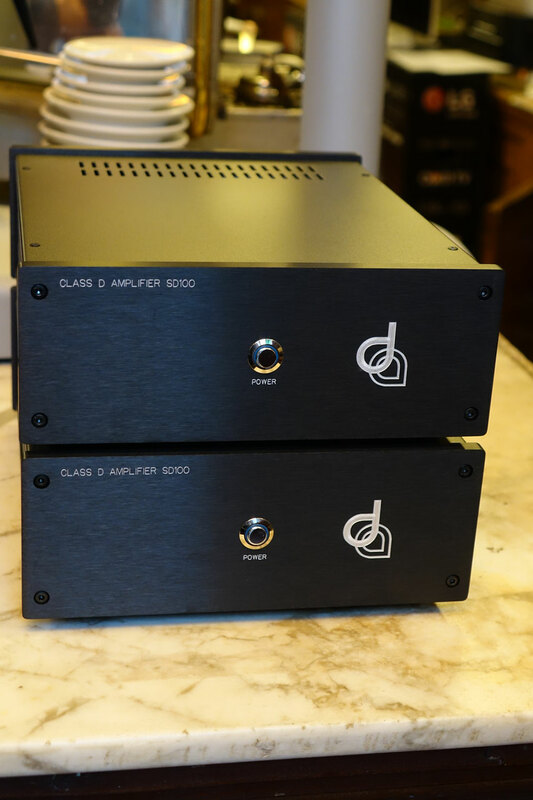 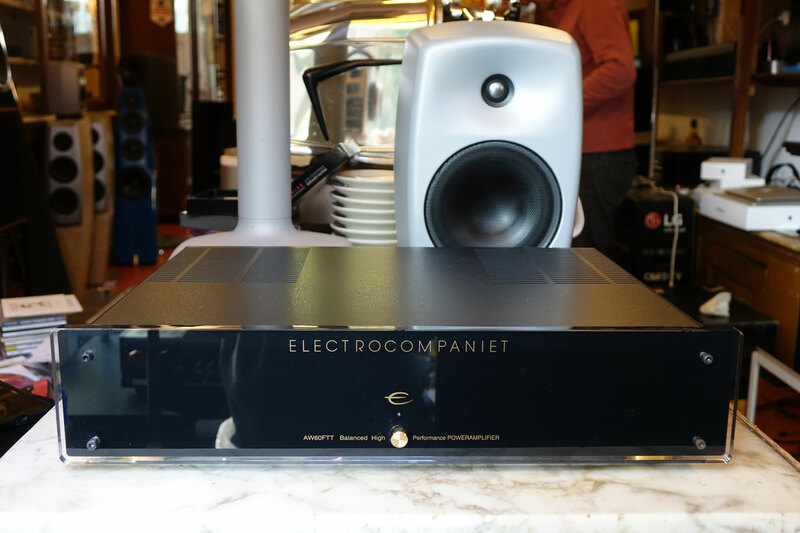 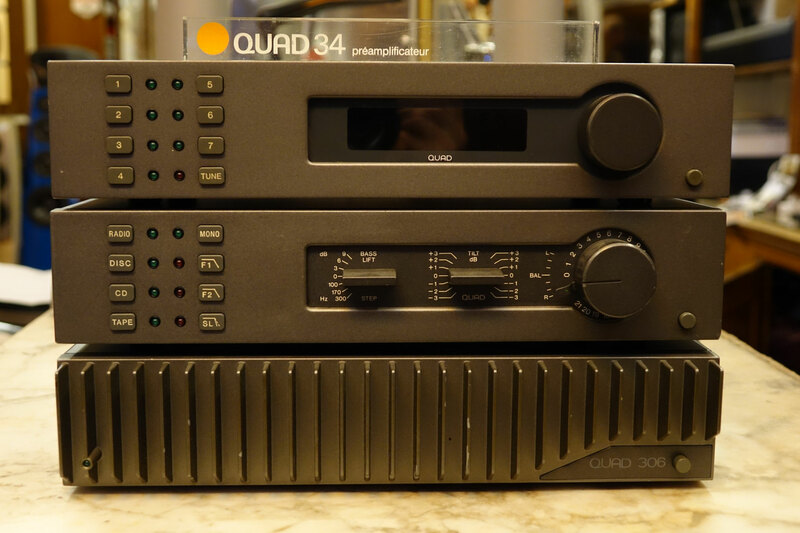 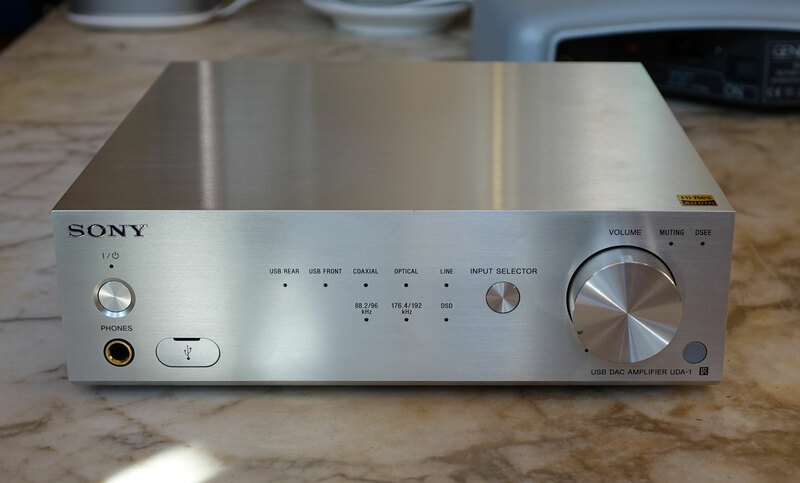 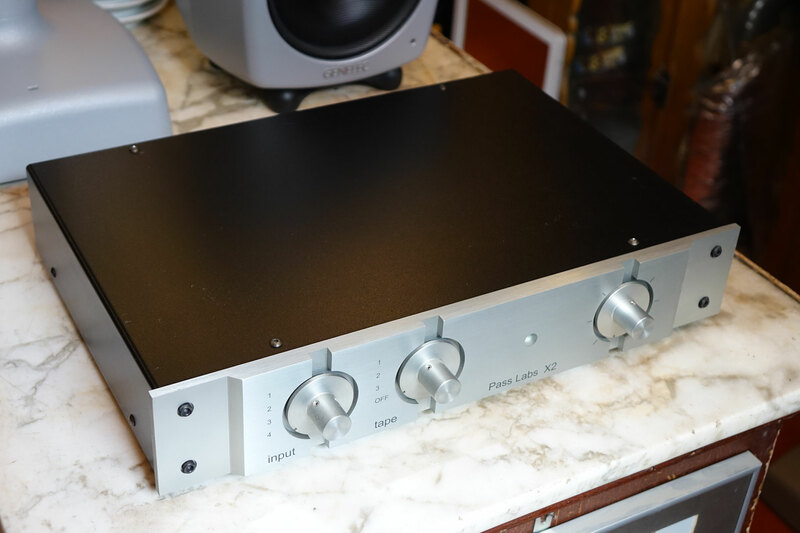 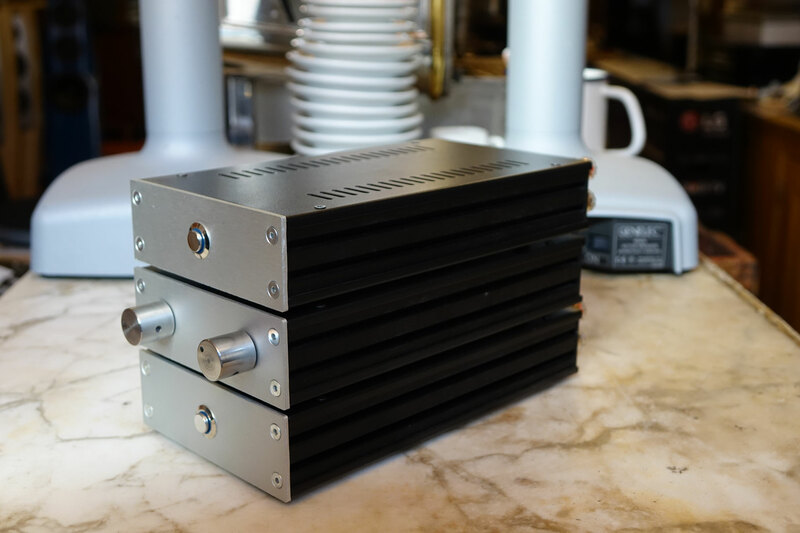 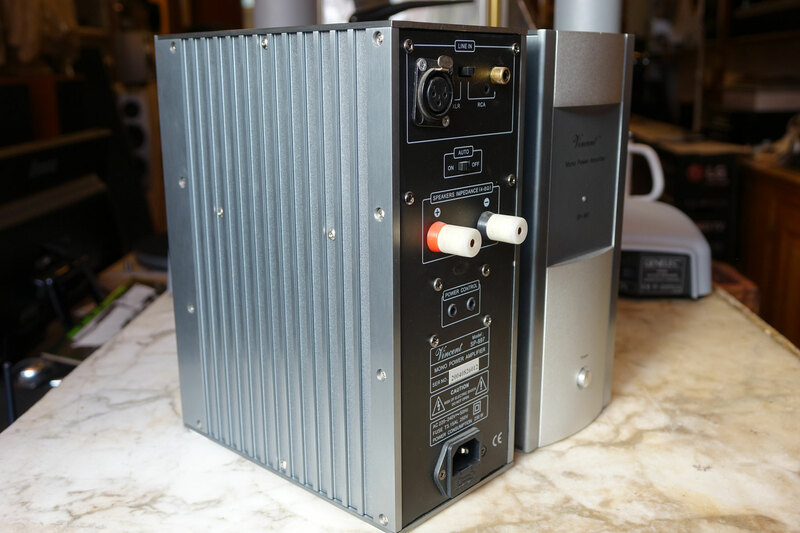 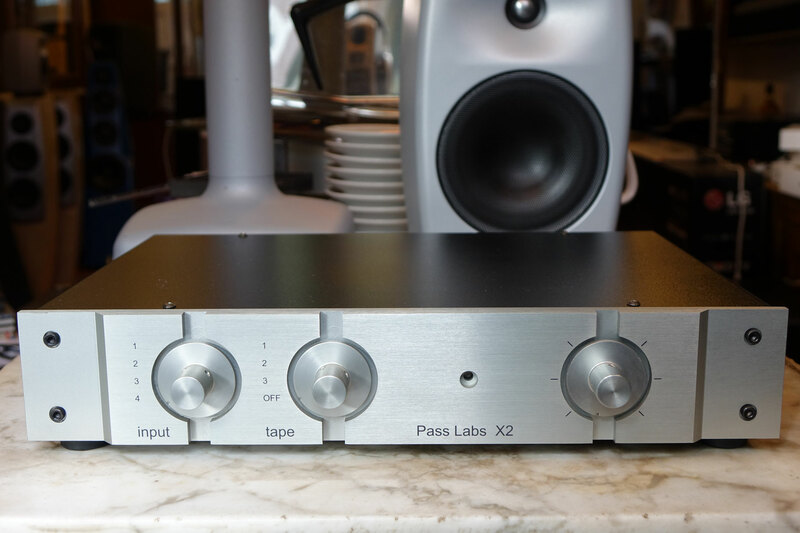 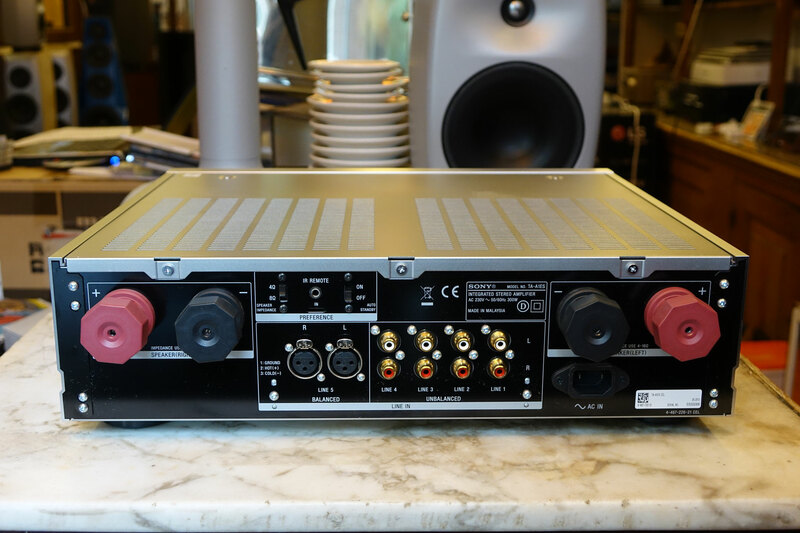 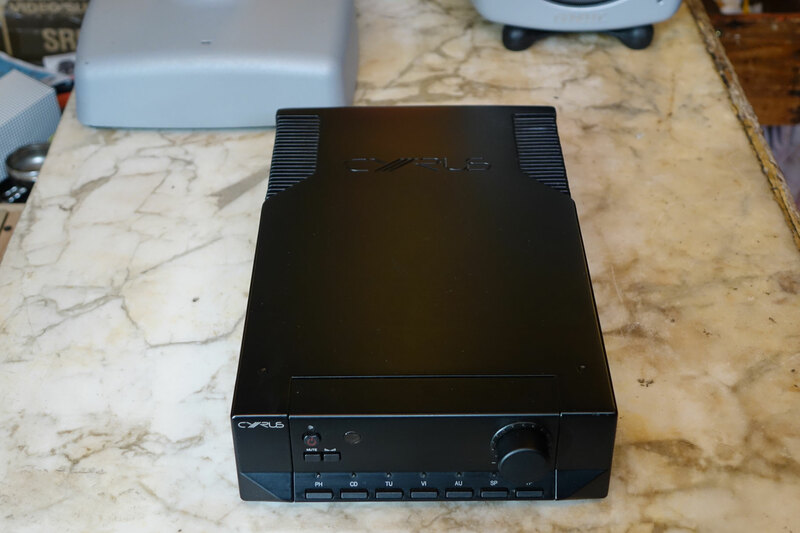 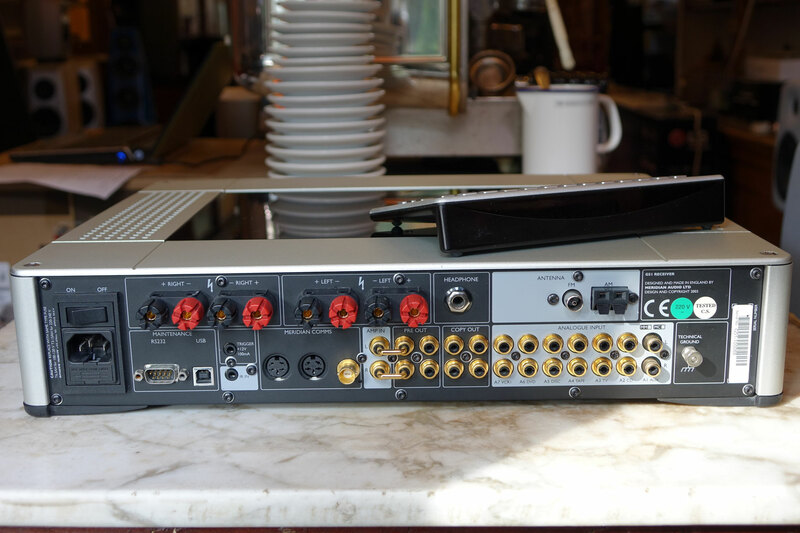 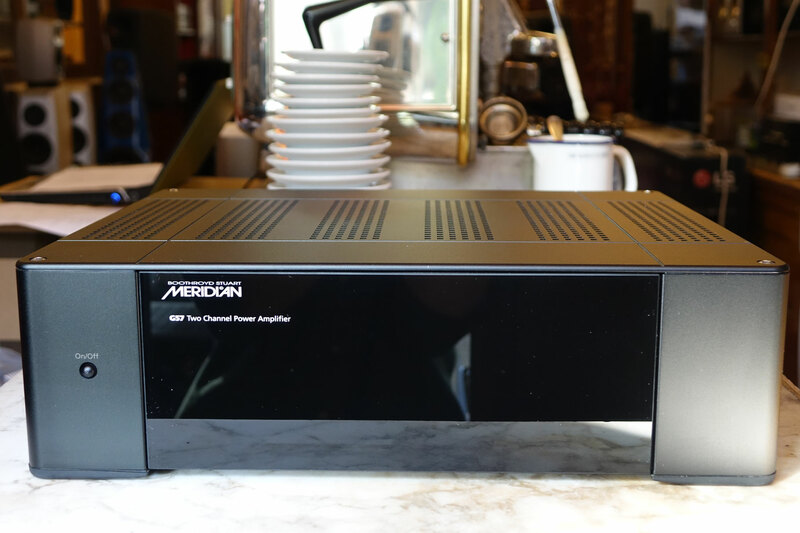 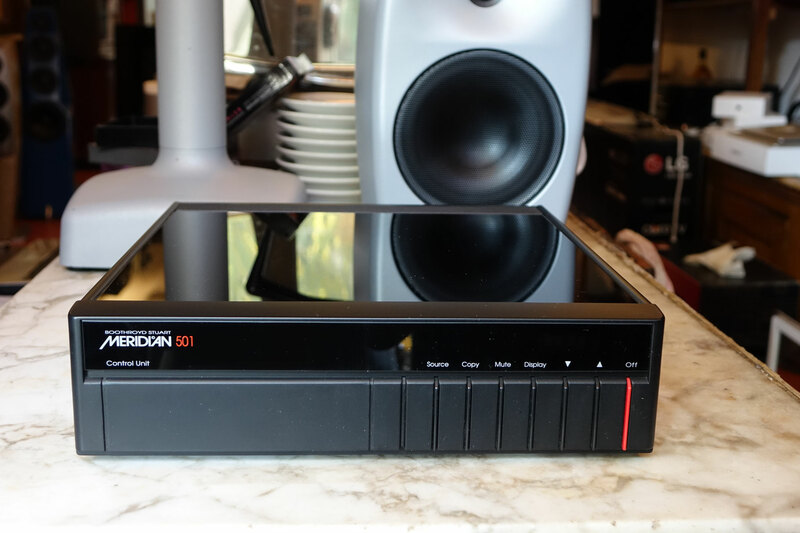 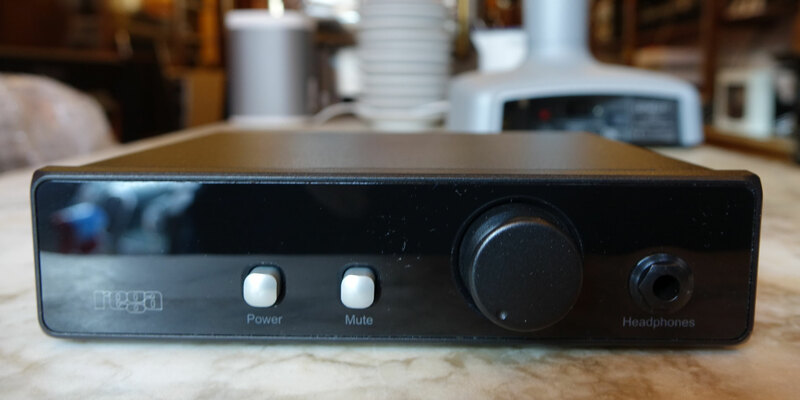 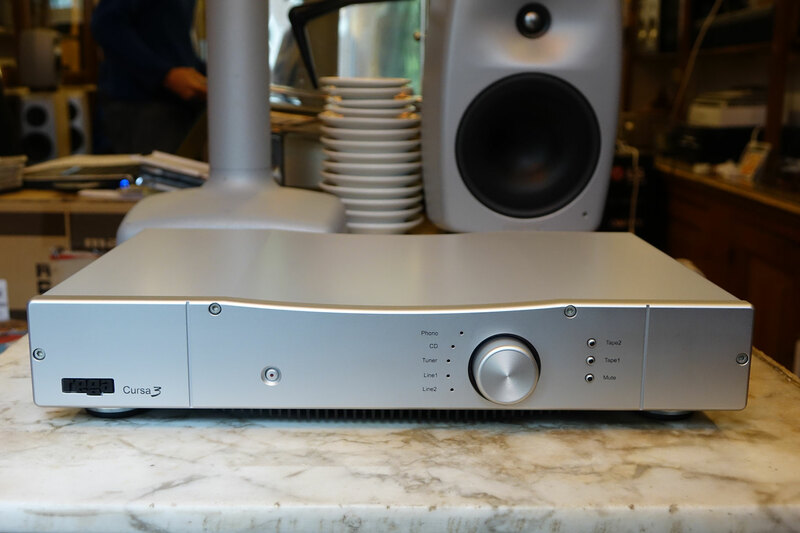 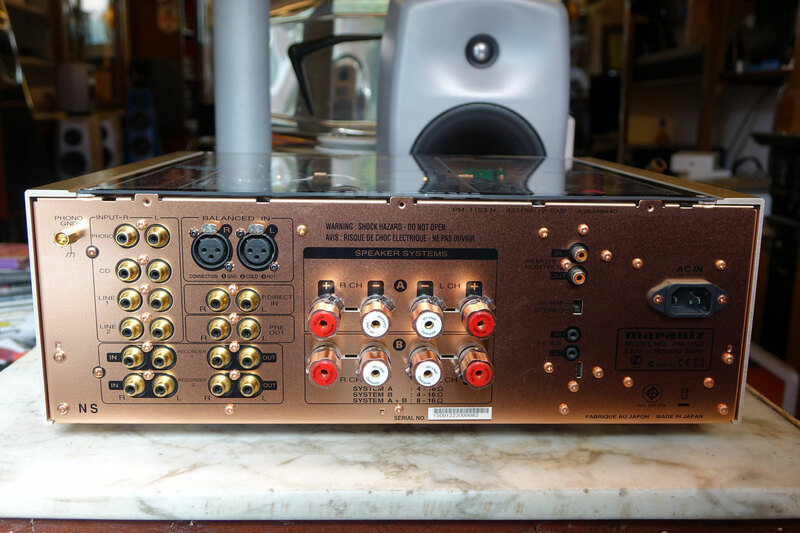 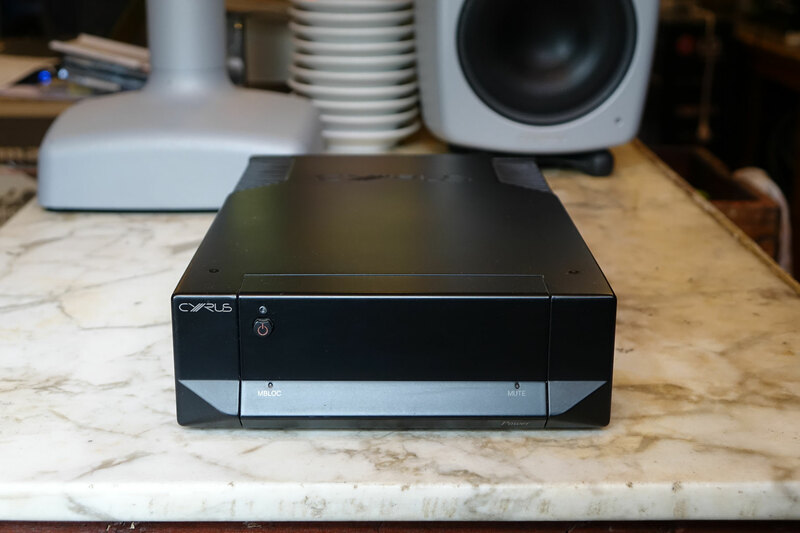 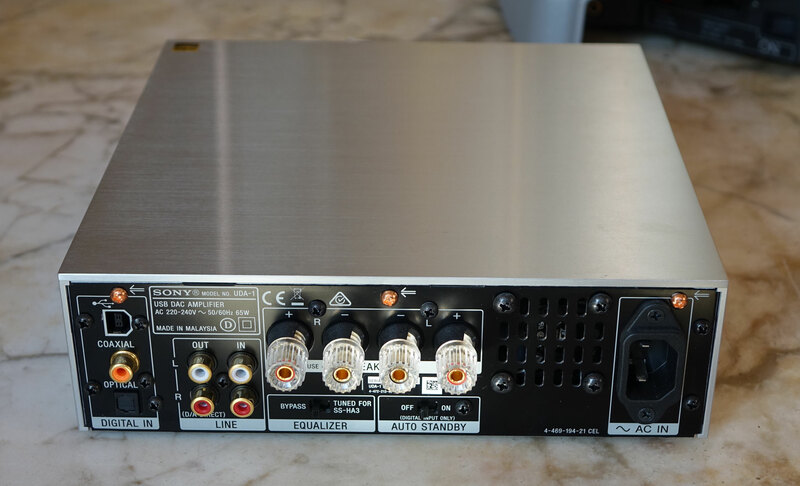 Line input sensitivity - 200mV (RCA), 77.5mV (CD XLR), Phono input sensitivity - MM: 2.75mV, Optional MC: 150mV, Line input impedance - 12.5 kOhm, Phono input impedance - MM: 47kOhm, Optional MC: 100 Ohm, Line s/n ratio (ref. 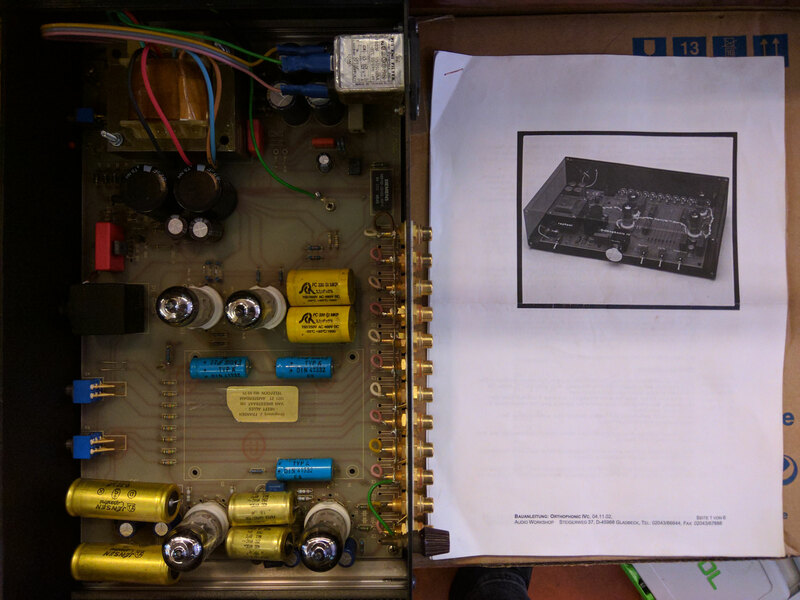 500mV) 105dBA - MM s/n ratio (ref. 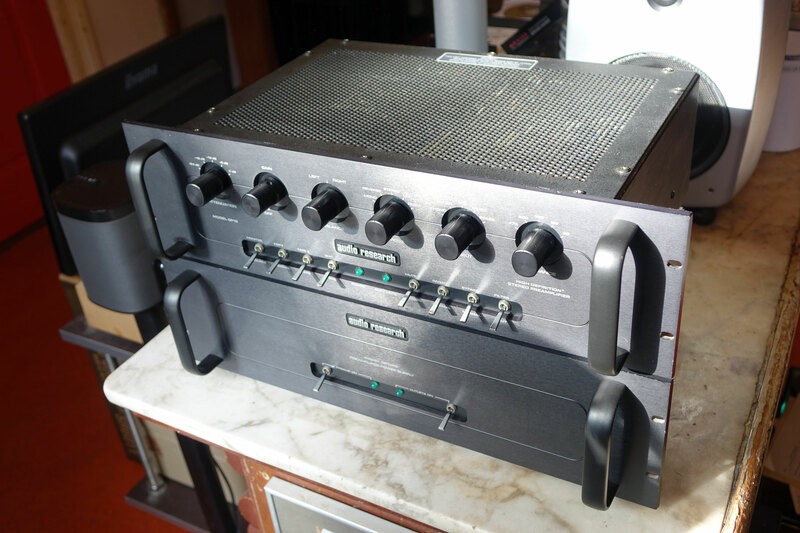 5mV) 87dBA MC s/n ratio (ref. 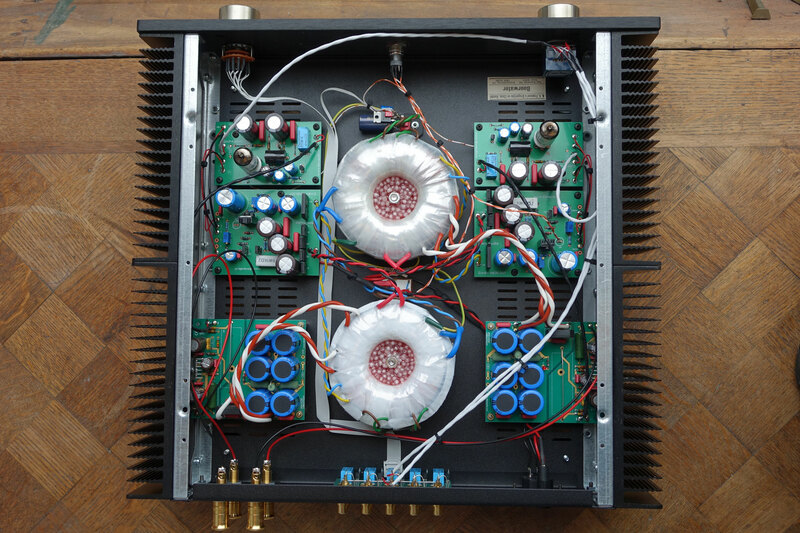 0.5mV) 78dBA, Equalisation tolerance - ±0.1dB (RIAA or new IEC Equalisation). 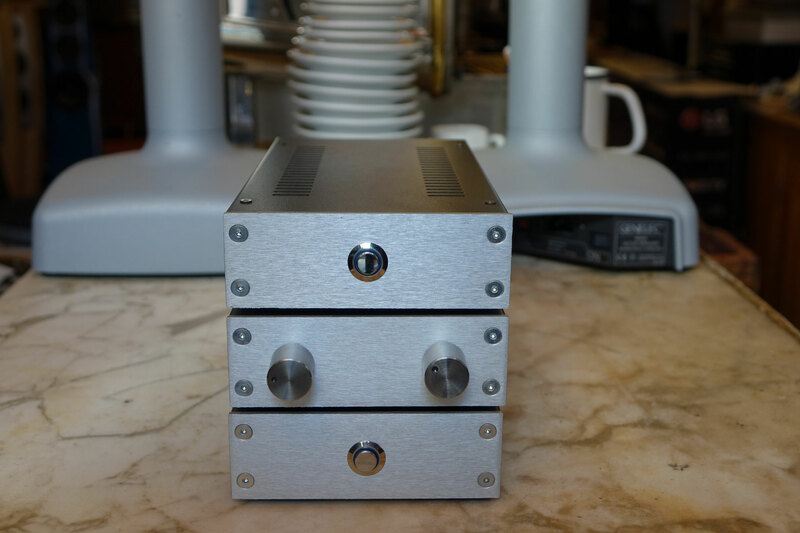 Dimensions - (H x W x D) 73 x 215 x 360 (mm), Weight - 3.1kg. 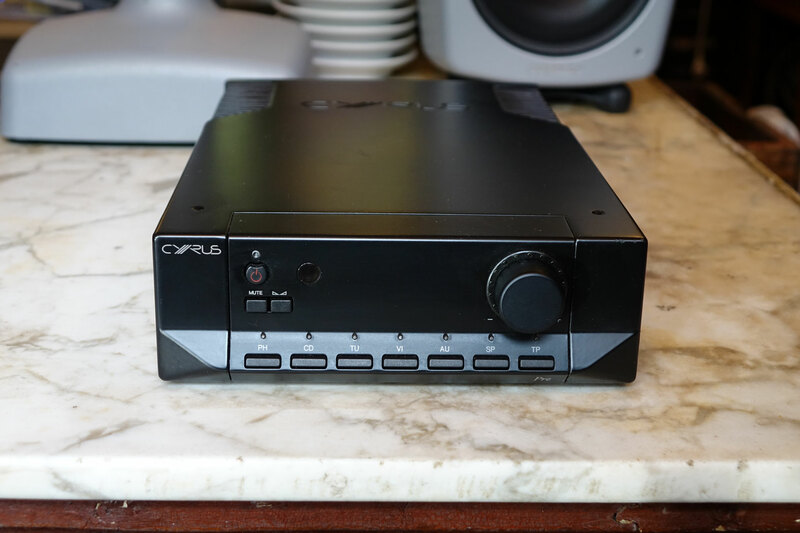 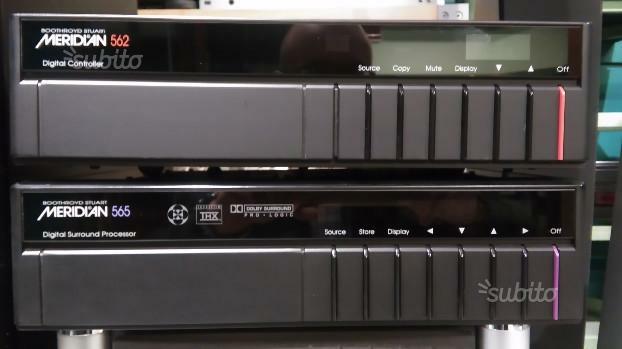 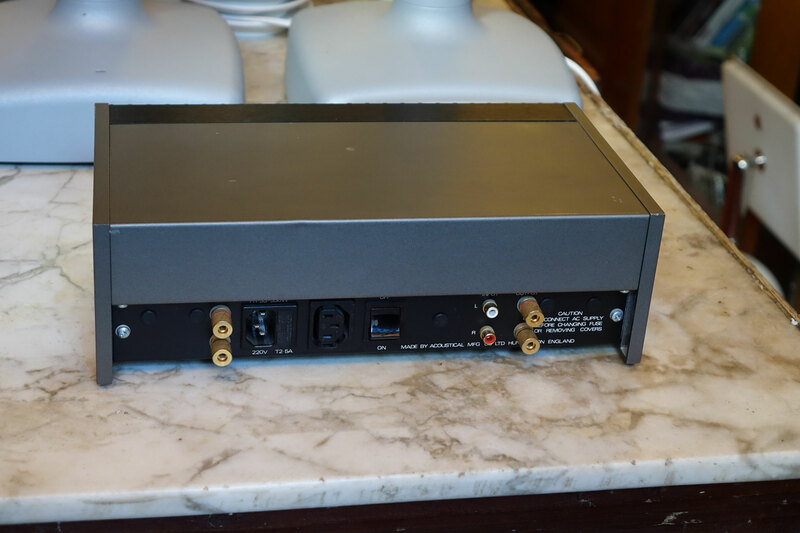 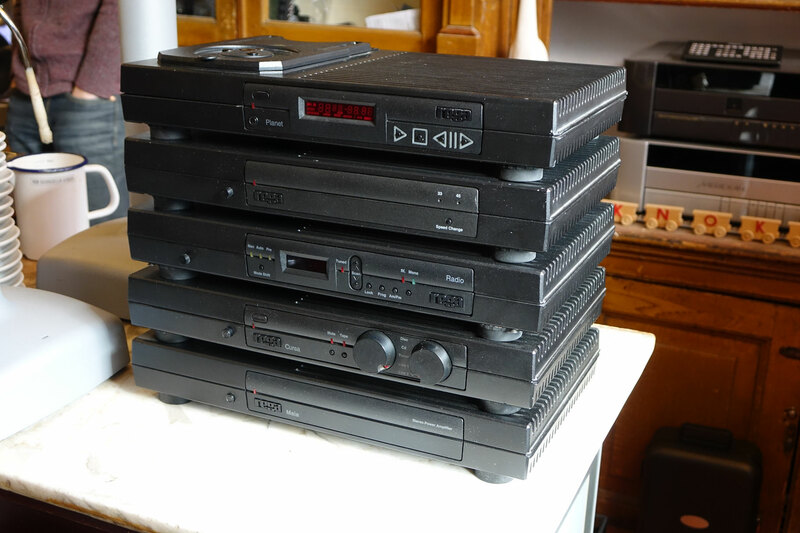 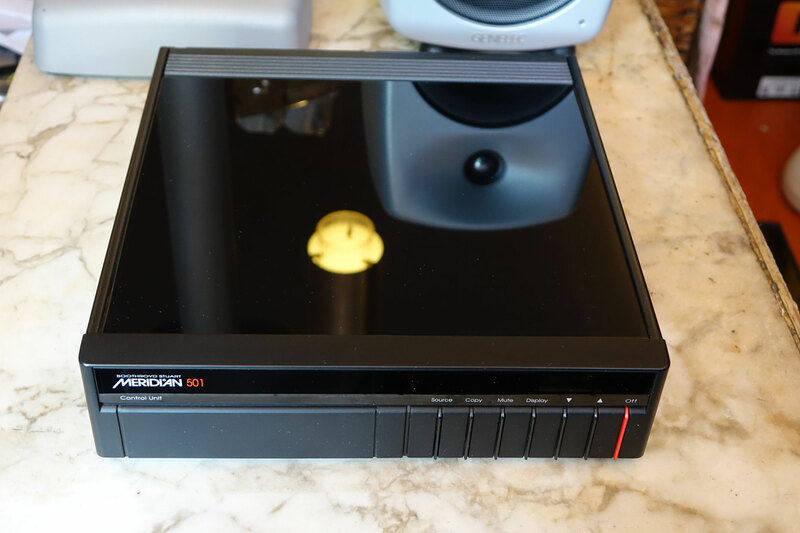 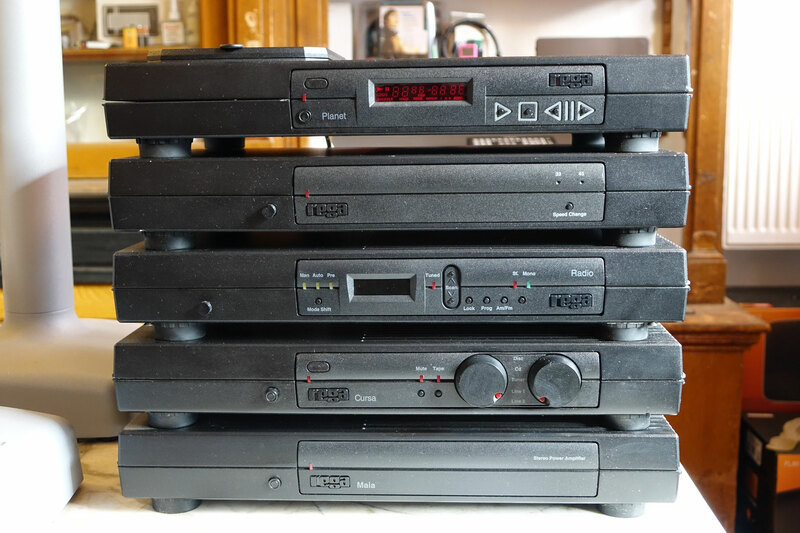 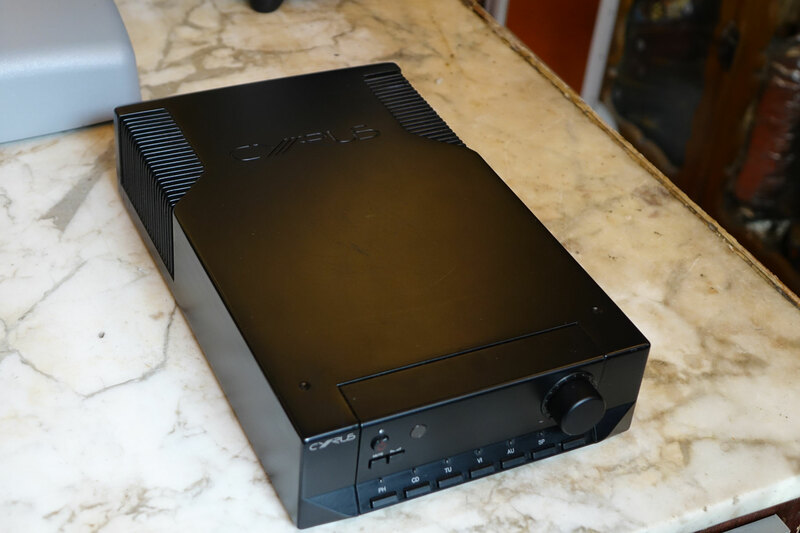 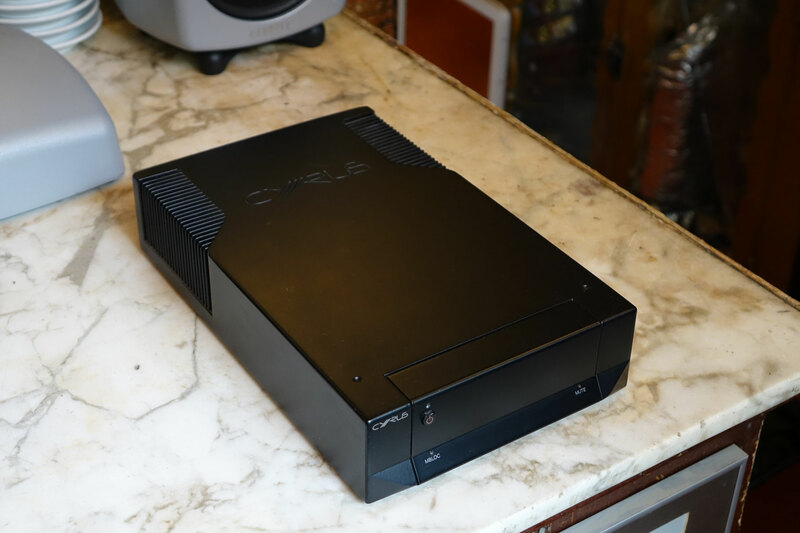 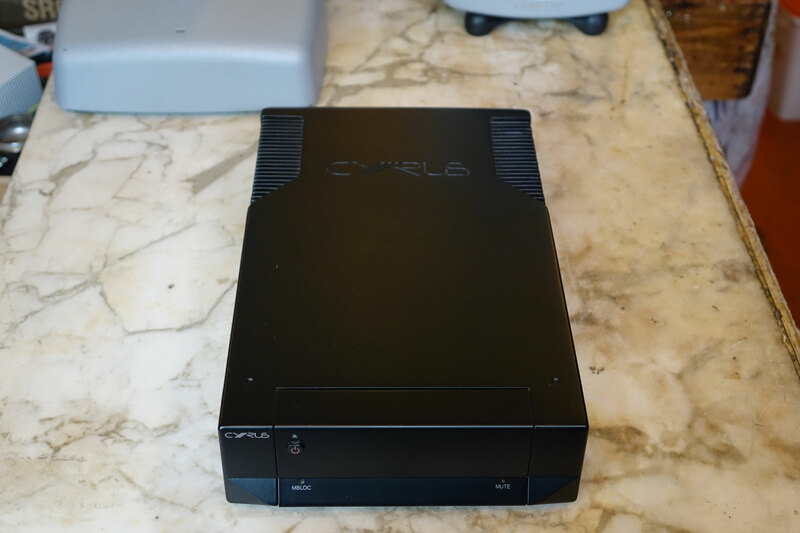 Description: Inputs - Phono, CD, tuner, Line 1, line 2, 2x Tape (input sensitivity = 220mV Load, 10K Ohm, Phono input sensitivity (Moving Magnet) = 2.3mV Load 47K in parallel with 100pF, Phono input sensitivity (Moving Coil) = 175uV Load 100 Ohms in parallel with 4700pF). 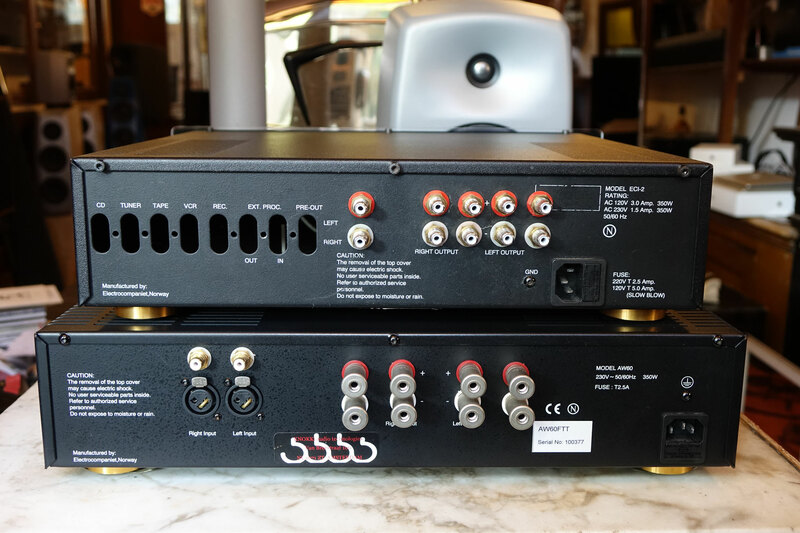 Outputs - 2x Pre-amp output level (with rated input levels 1 = 212mV @ 100 Ohms, Level 2 = 830mV @ 100 Ohms, Level 3 = 1.25V @ 100 Ohms. 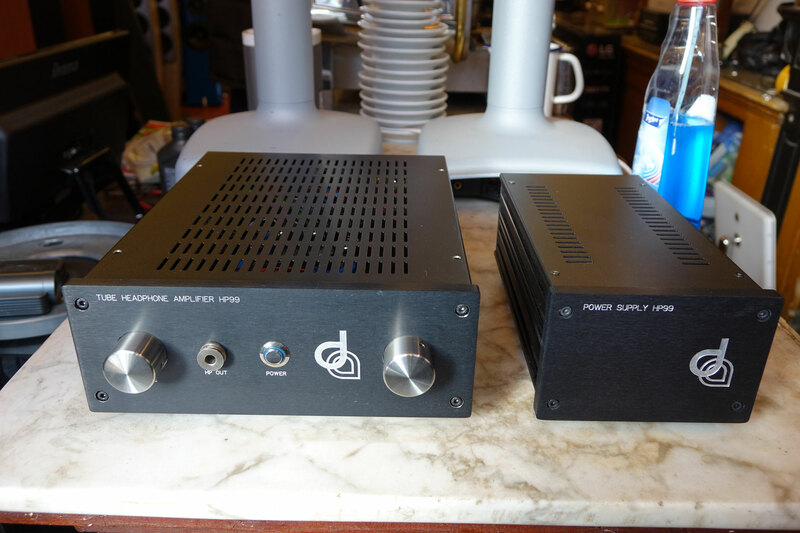 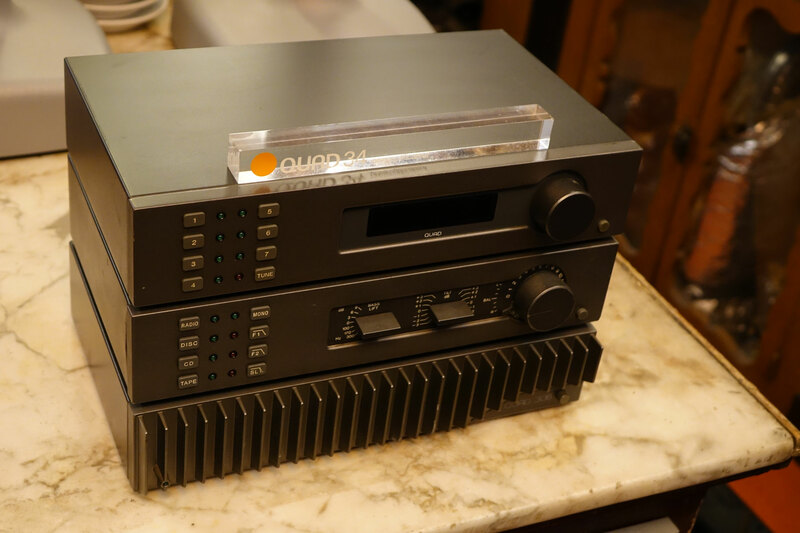 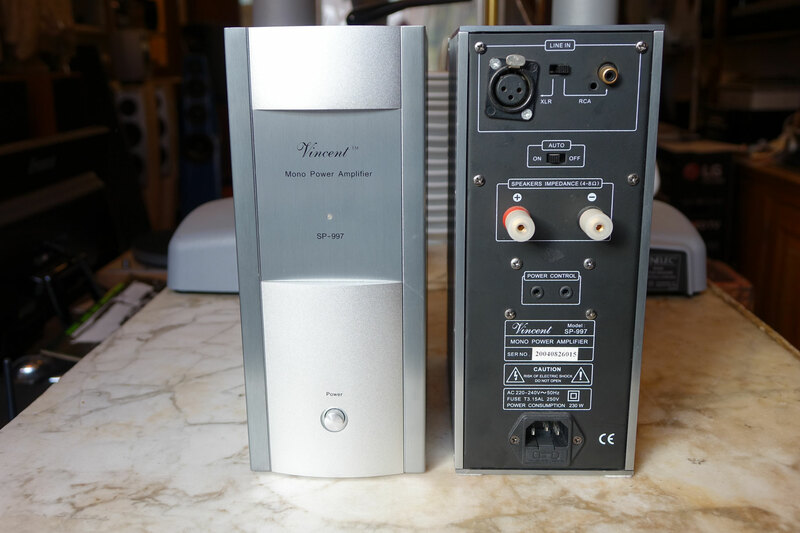 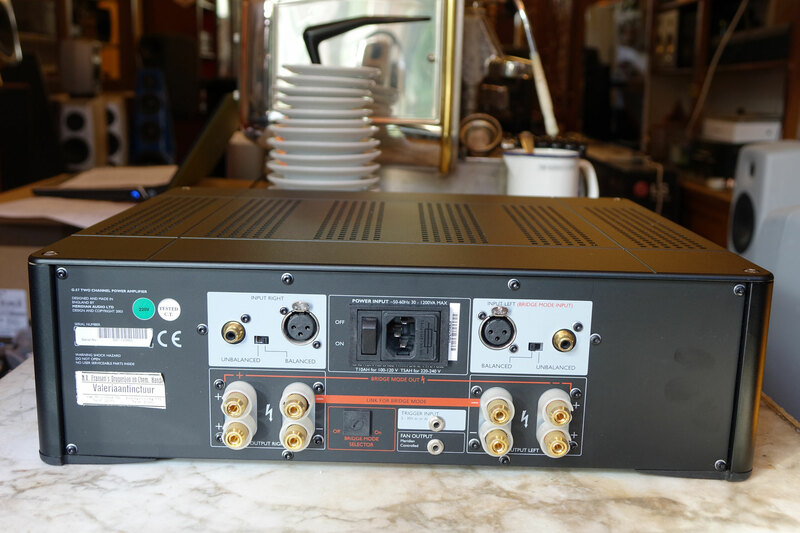 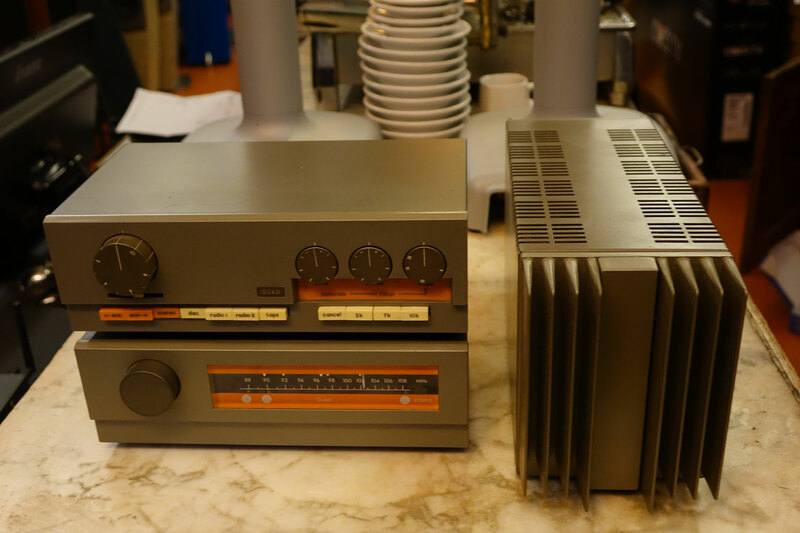 ), 2x Tape output (with rated input levels 215mV @ 560 Ohms). 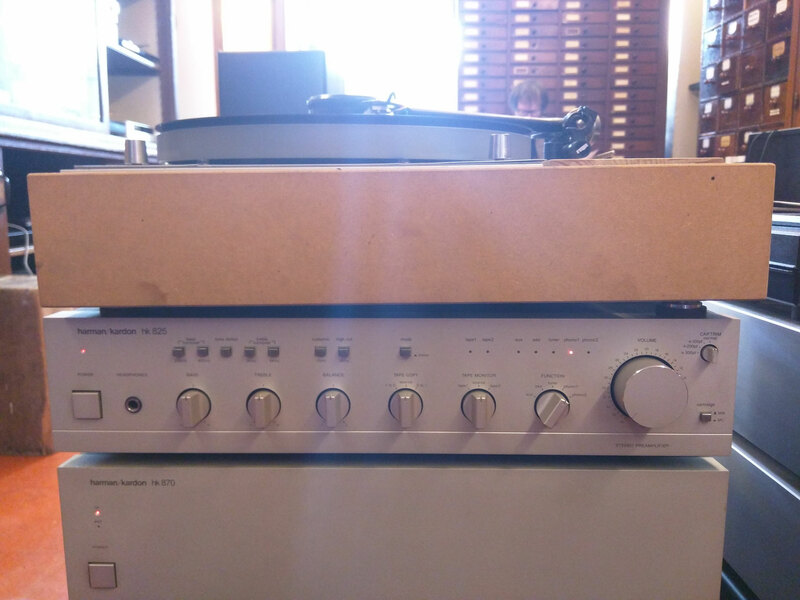 Maximum output level 8.8V. 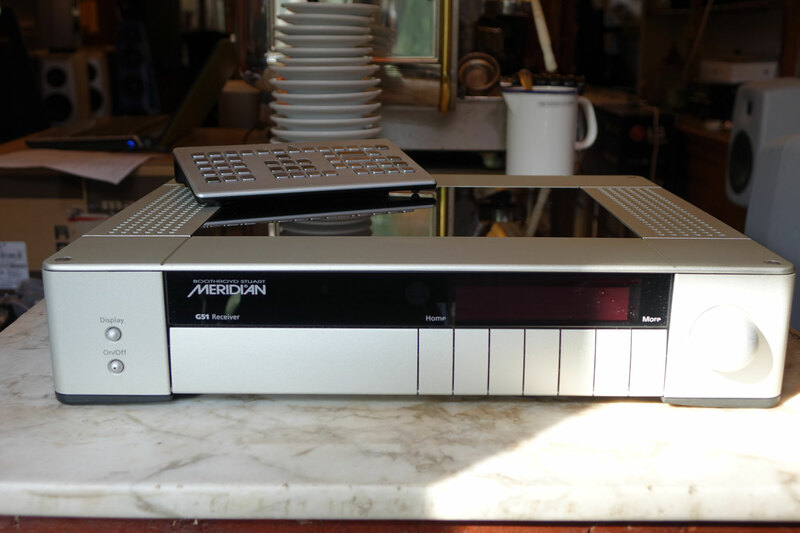 Accessories: all original, including solar remote. 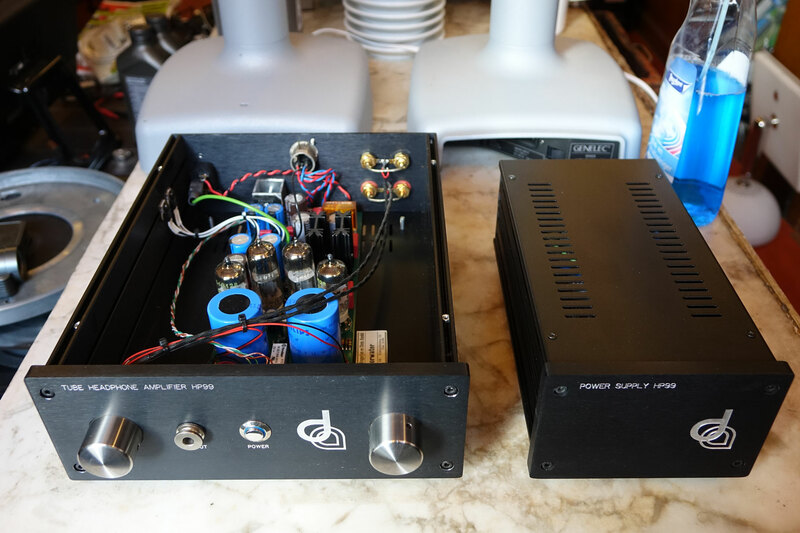 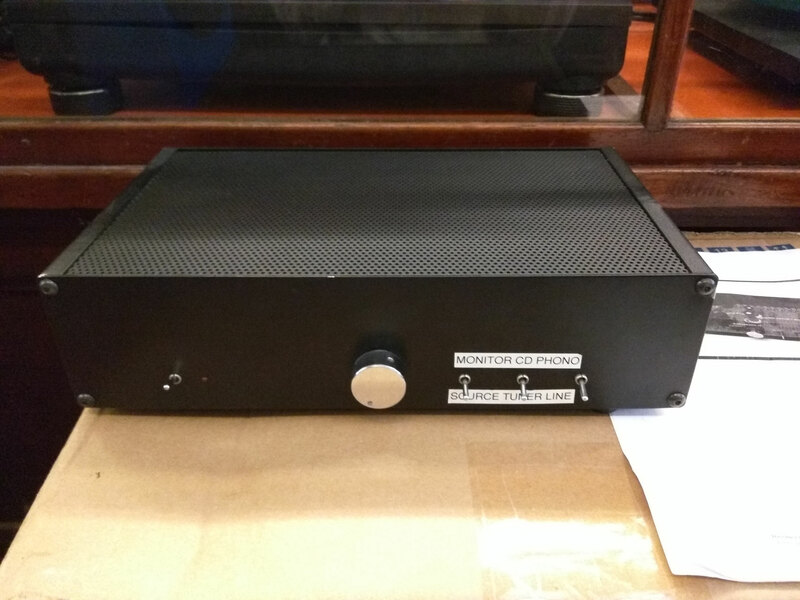 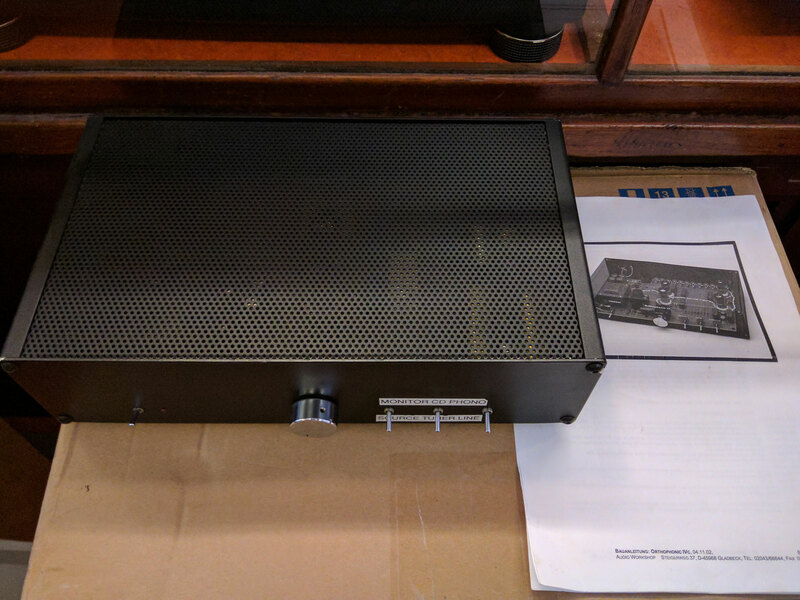 Description: AM/FM RDS/RDBS receiver with 2 x 100W amplification. 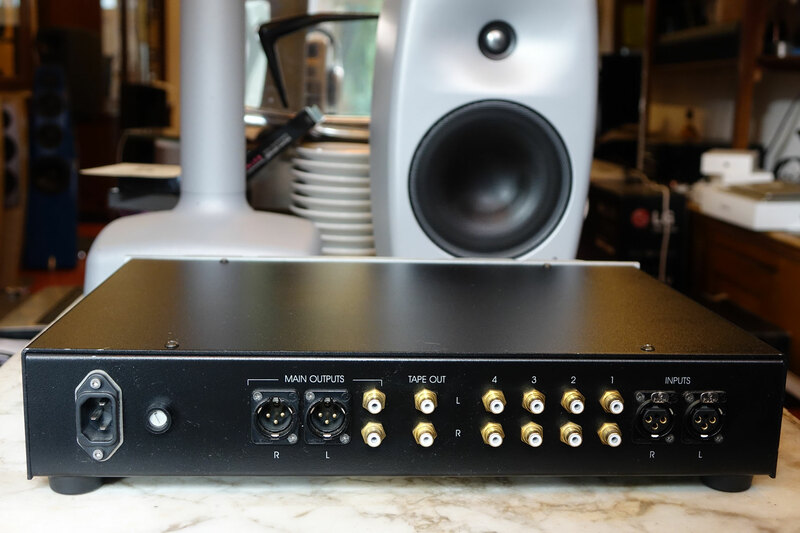 Inputs: Seven stereo analogue inputs. 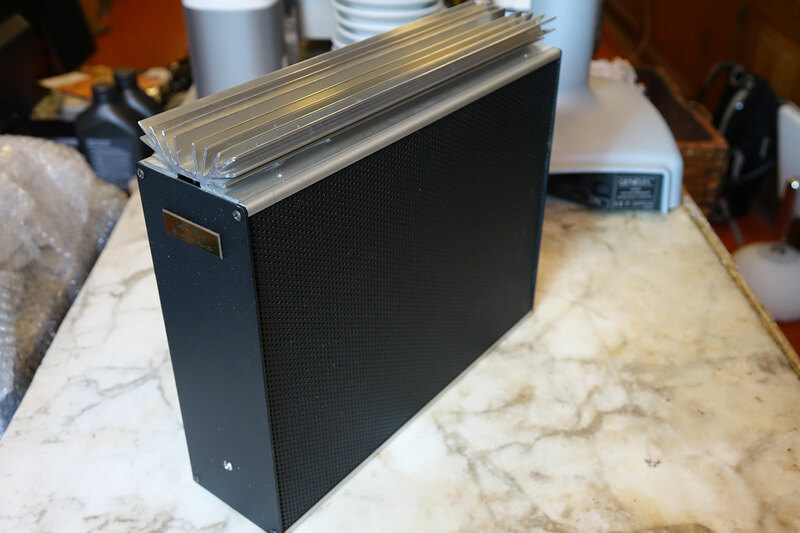 Outputs: 2x Tape-out, 2x Pre-out, 2x 100 W Bi-wire binding posts. 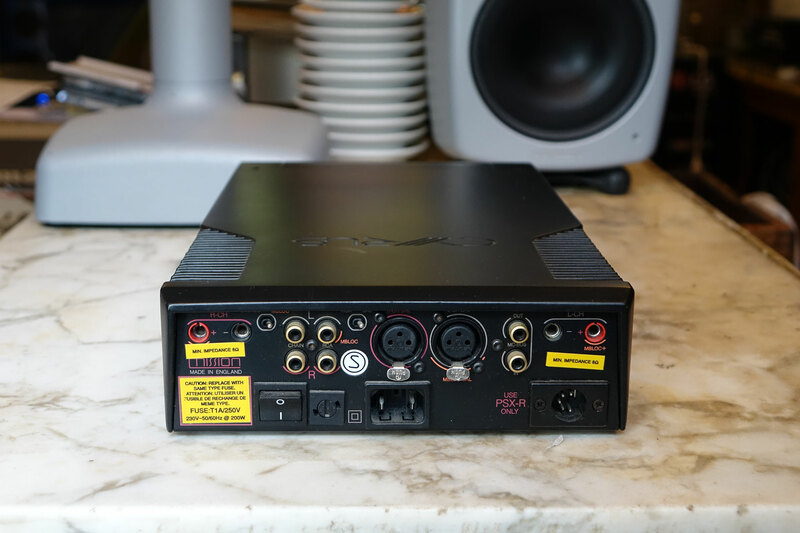 1x backpanel headphone socked. 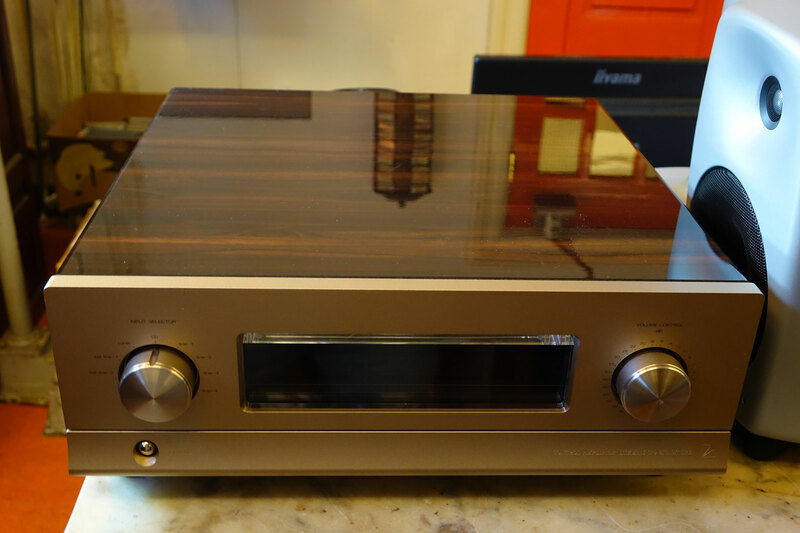 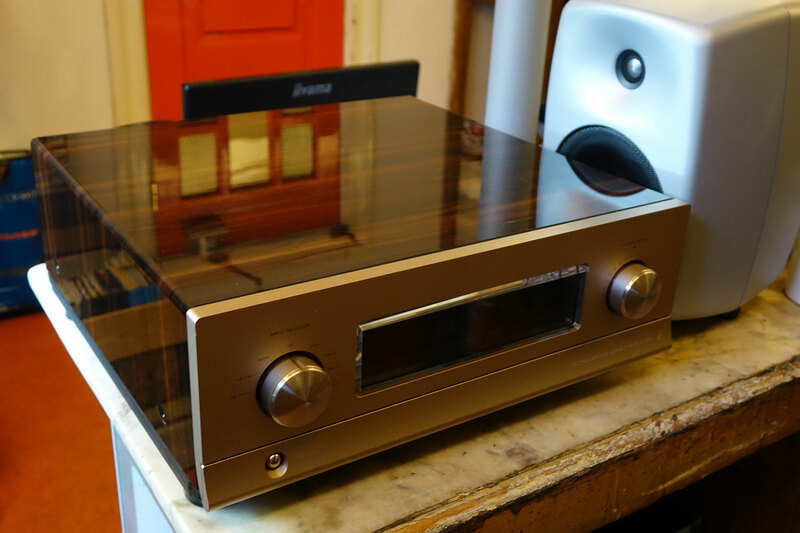 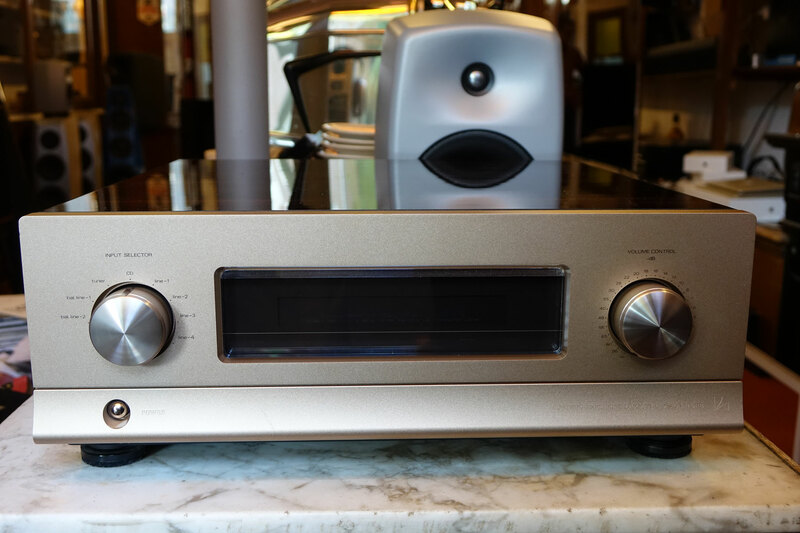 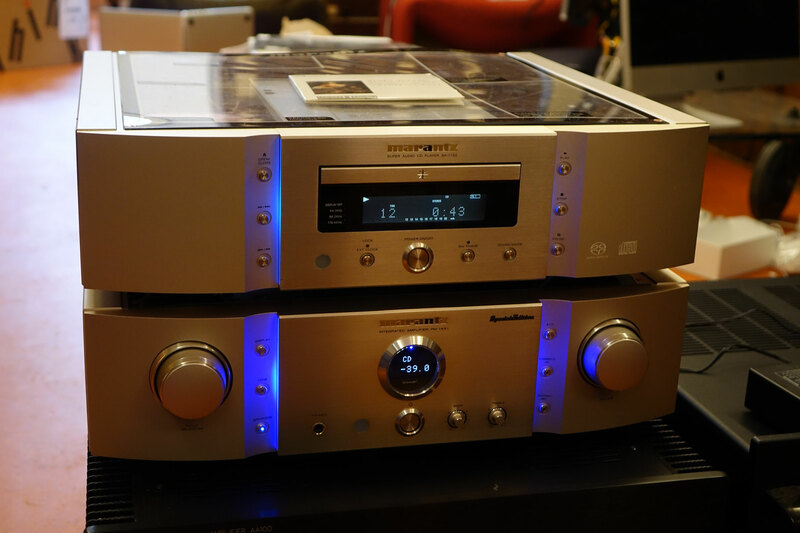 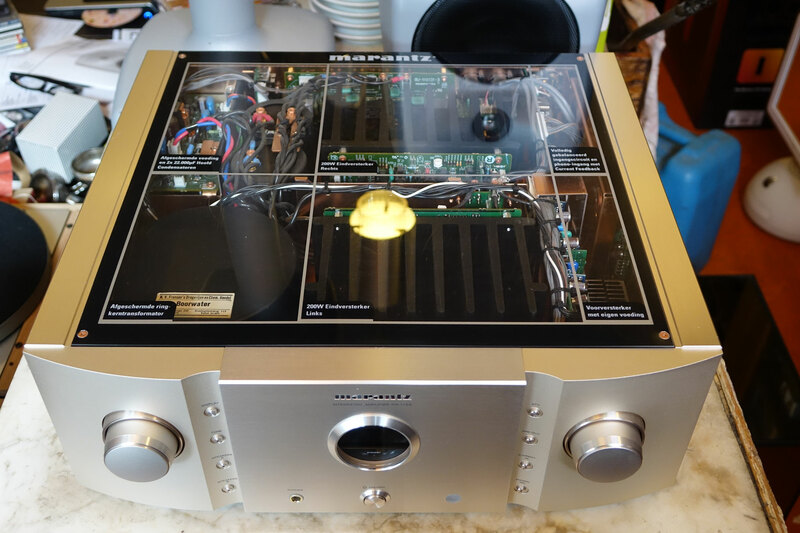 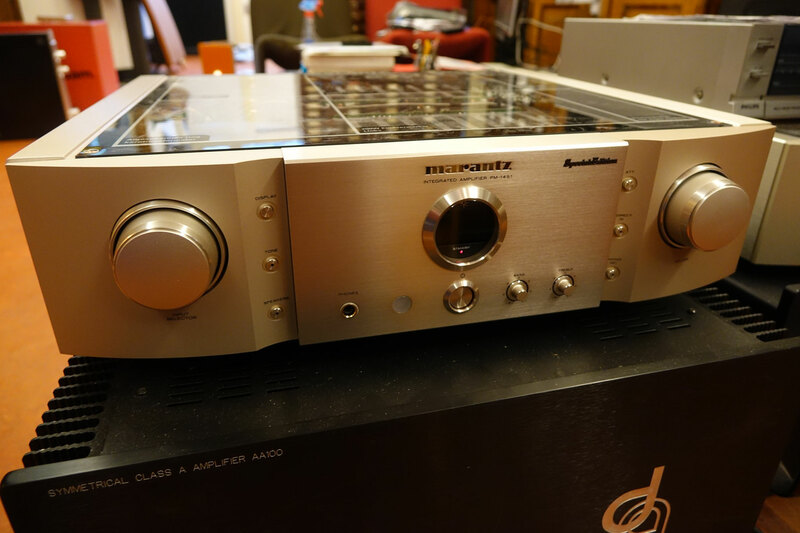 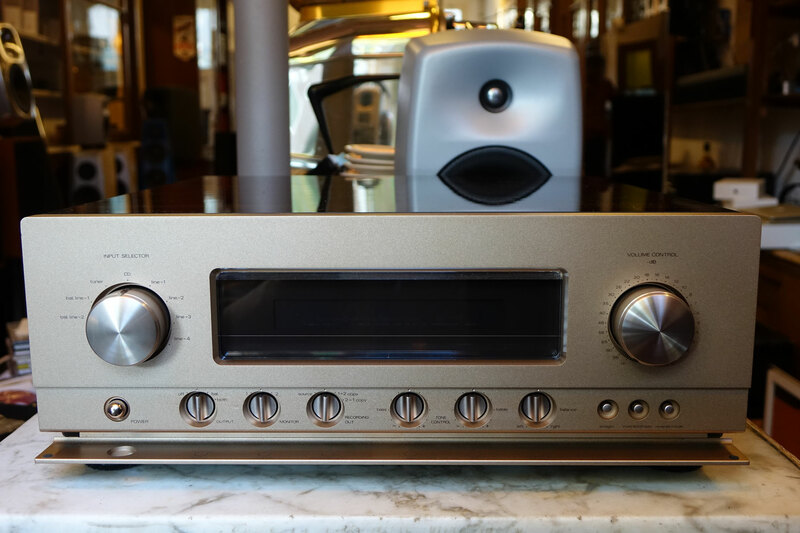 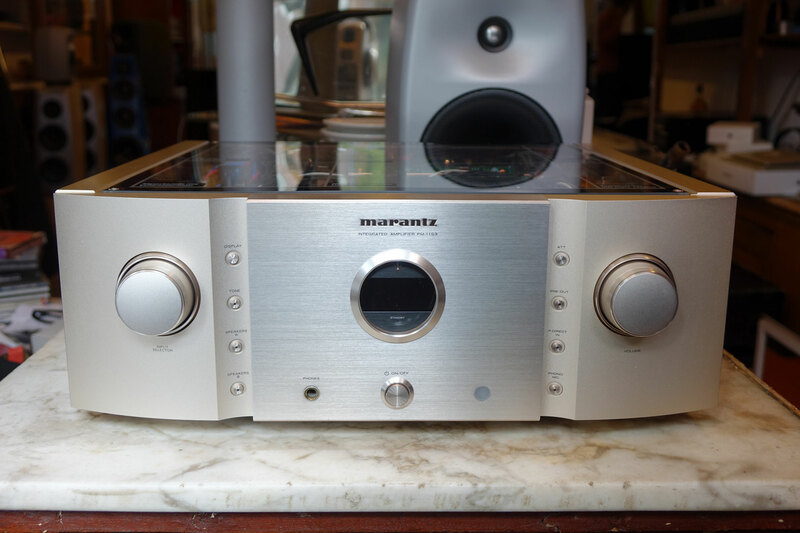 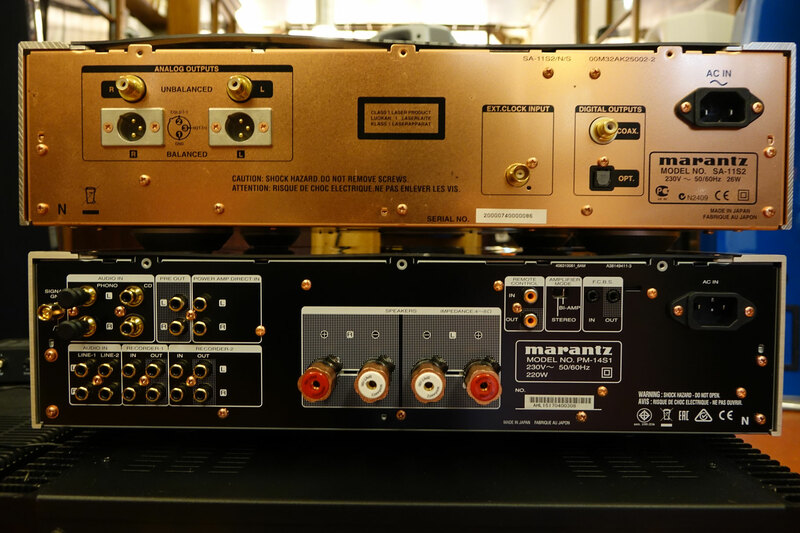 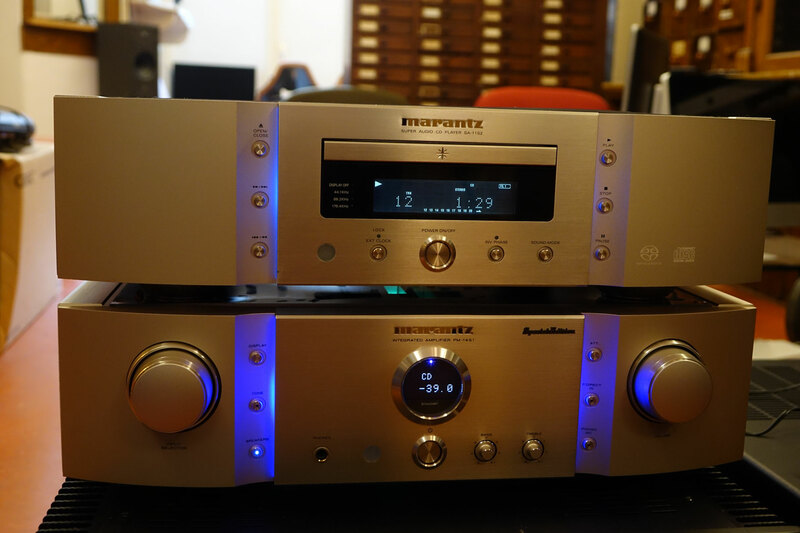 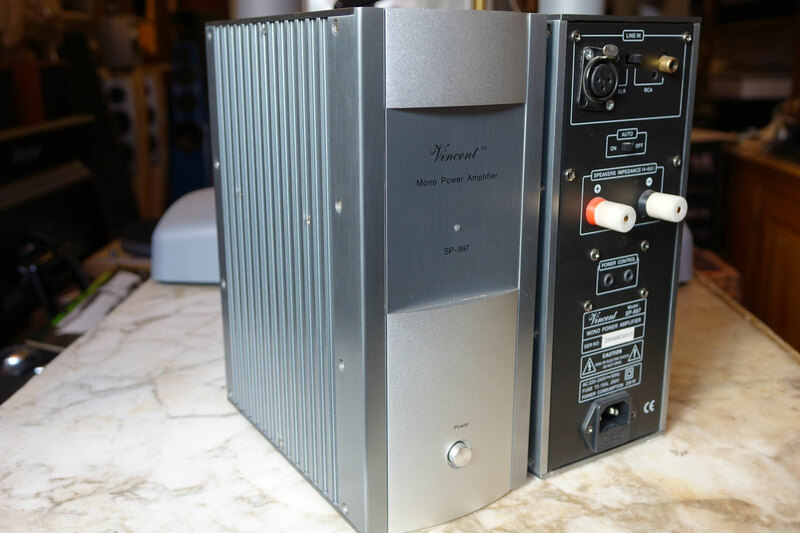 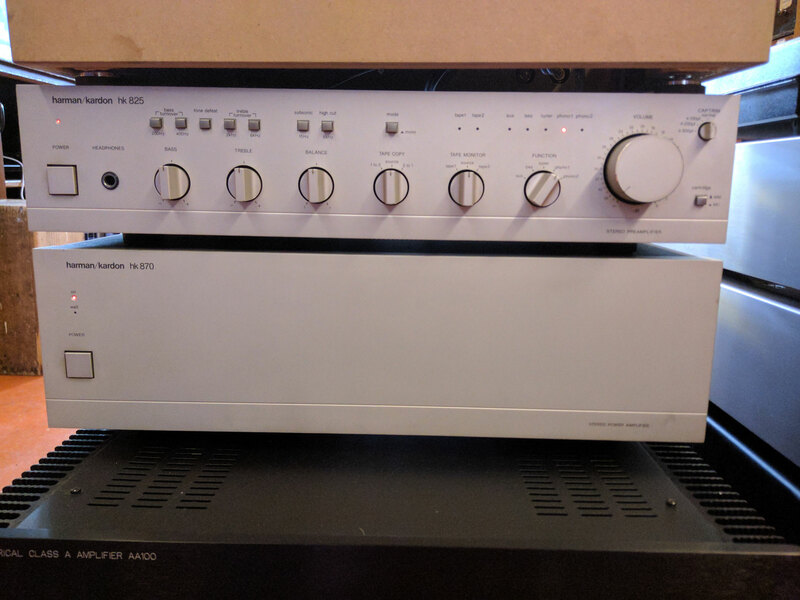 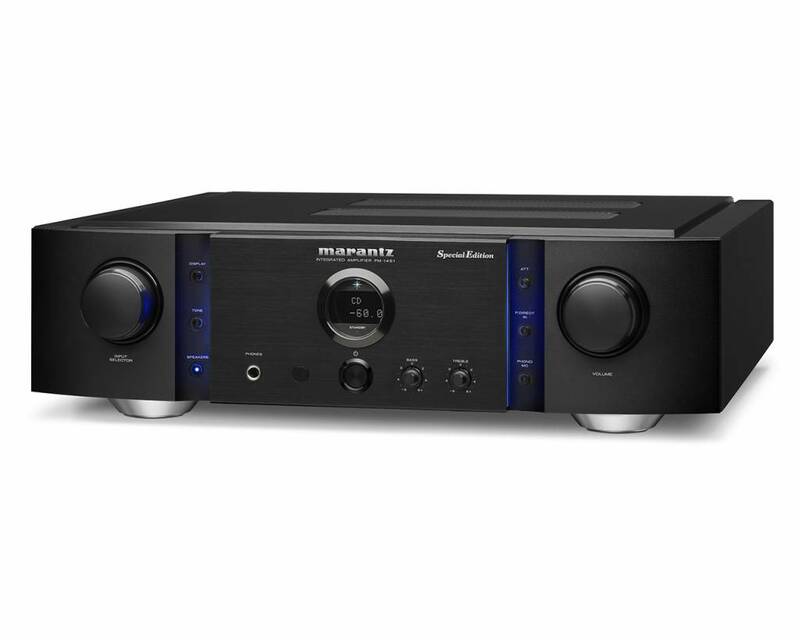 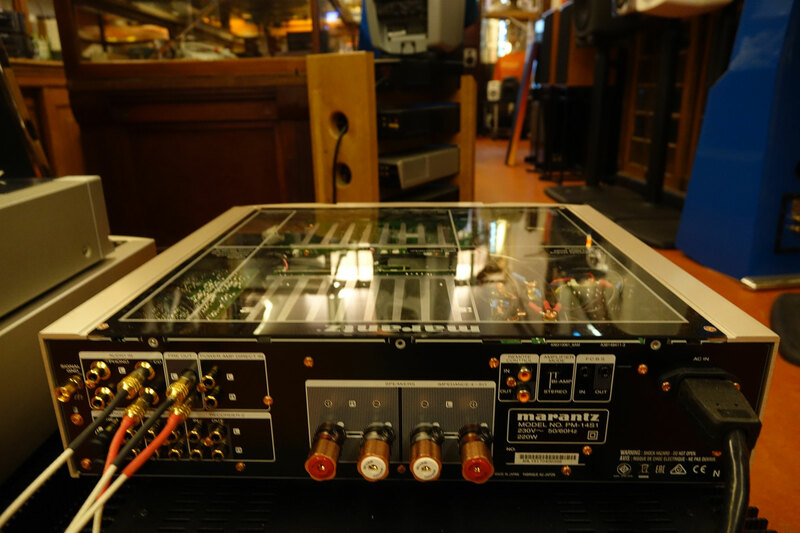 Marantz PM-11S3 (2-Ch Integrated Amp)-------SOLD!SOLD!SOLD! 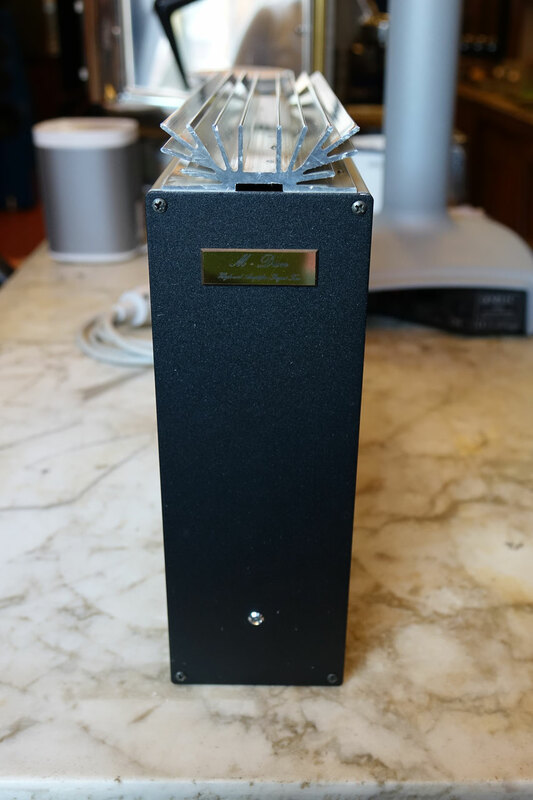 Accessories: All original, including packaging and metal remote. 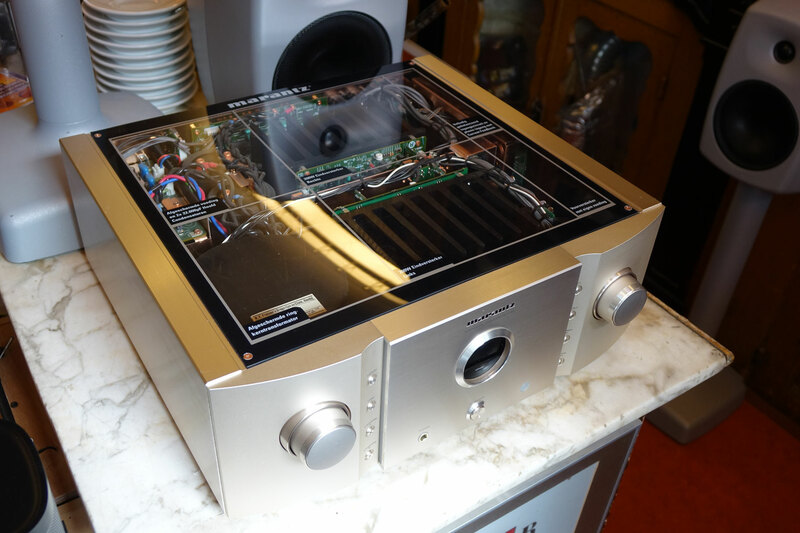 Also includes extra perspex display cover! 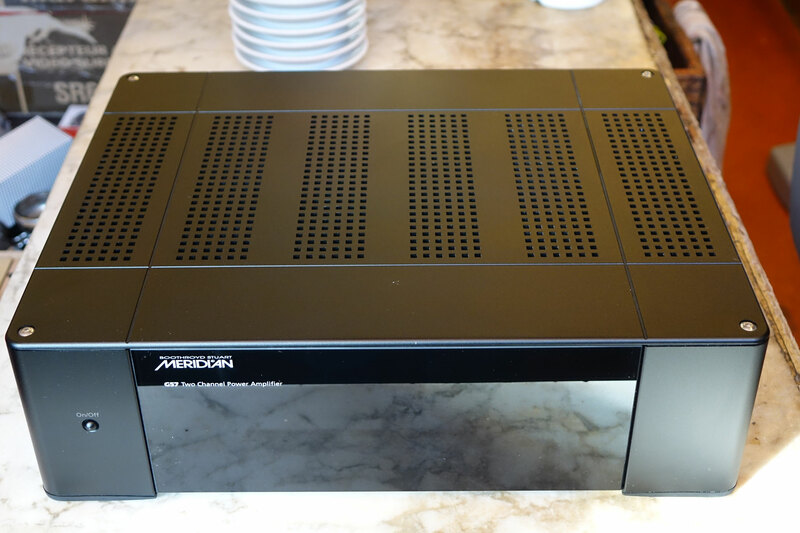 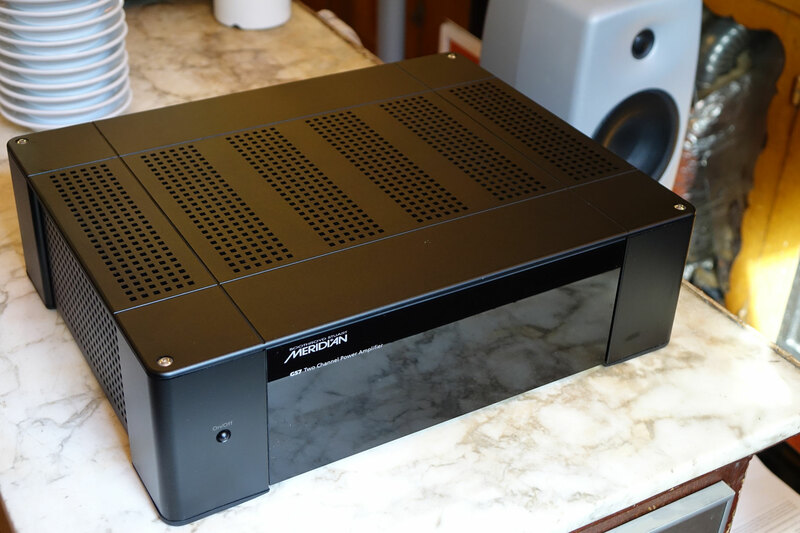 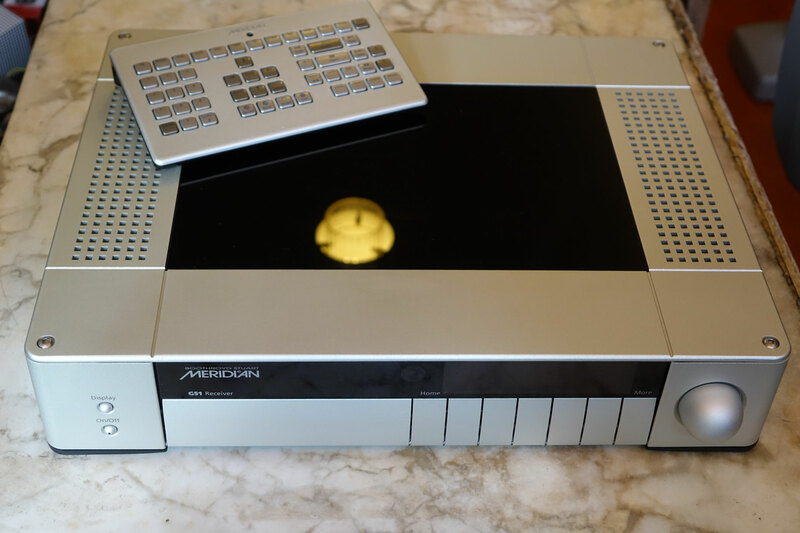 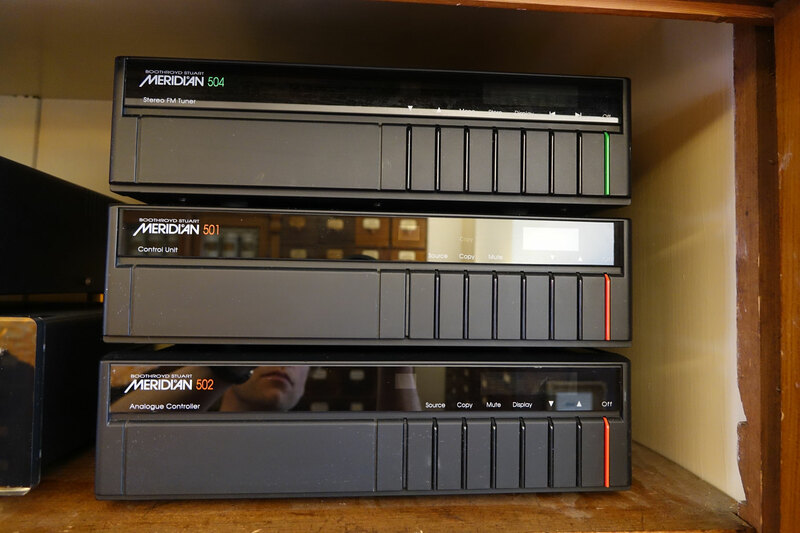 Description: Meridian 562 Multimedia controller / Preamp including digital outputs and high quality AD-converters. 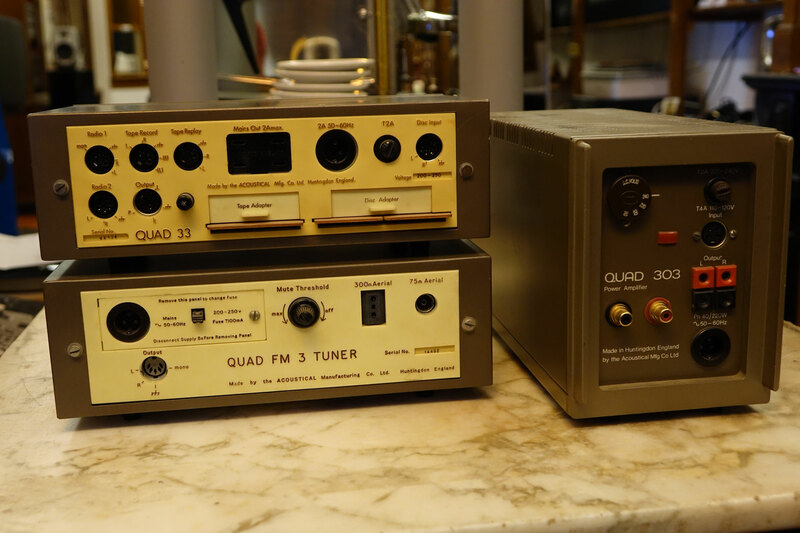 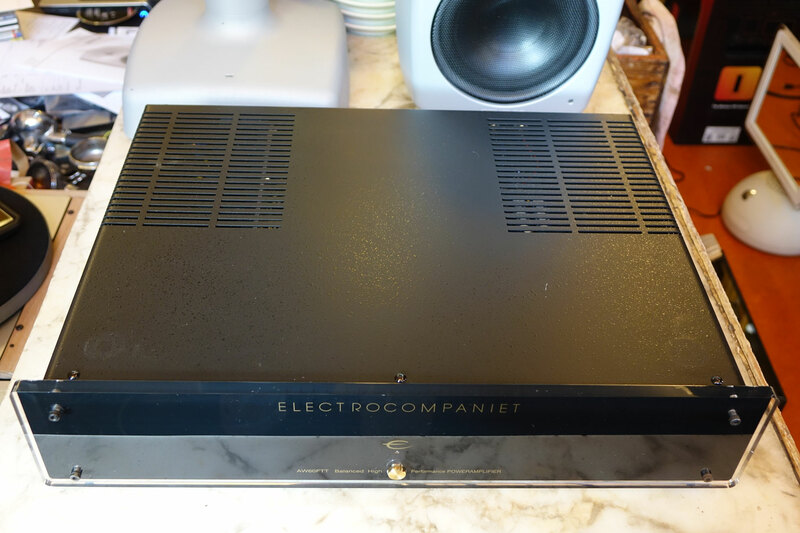 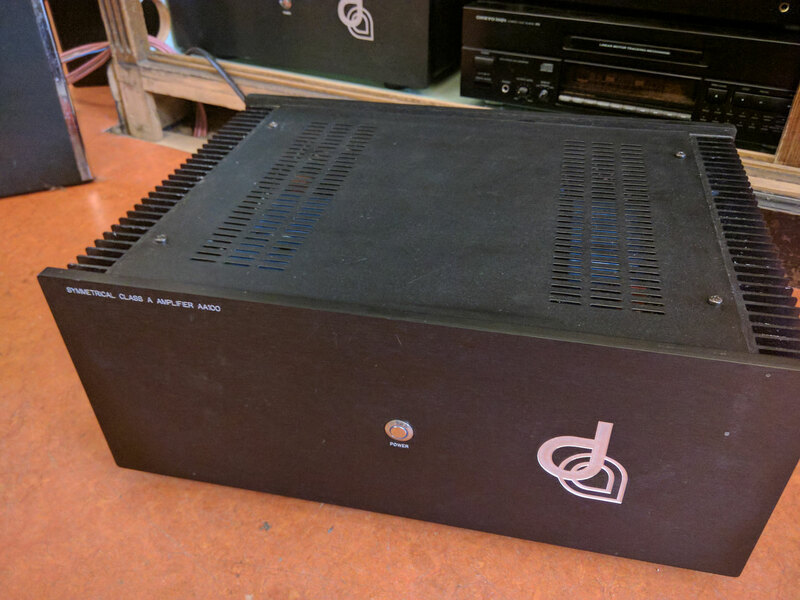 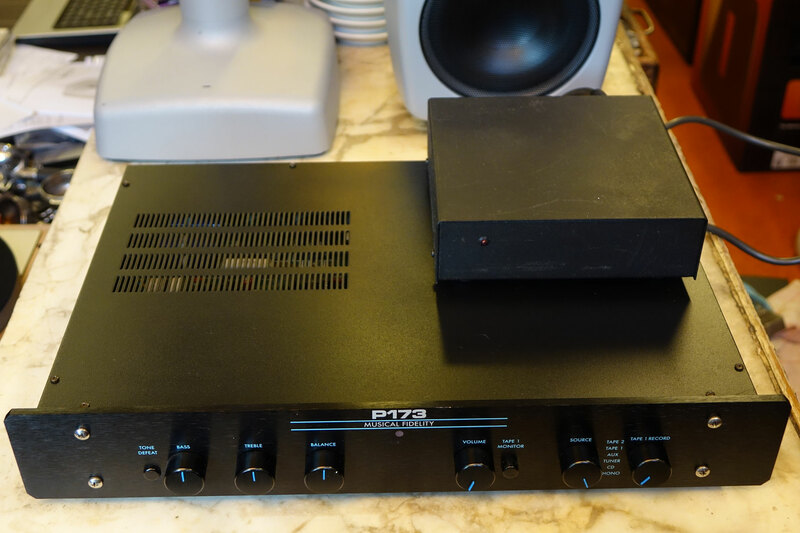 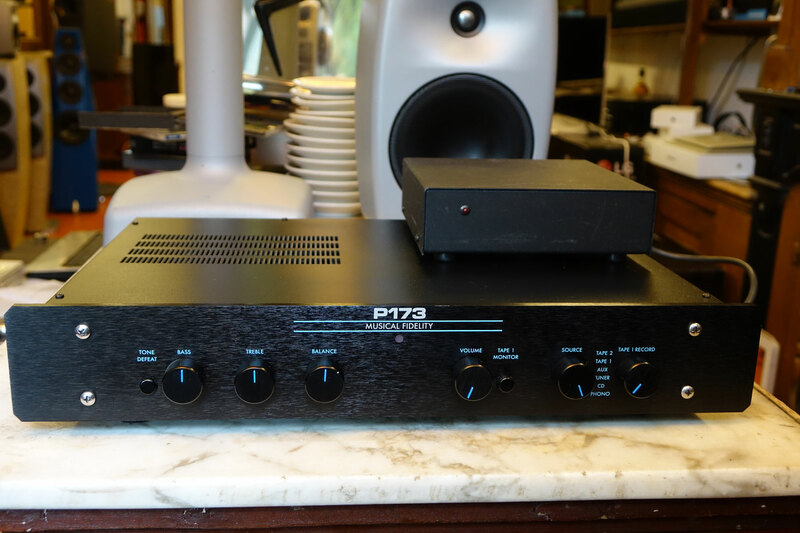 Optionally fitted with phono-board at surplus. 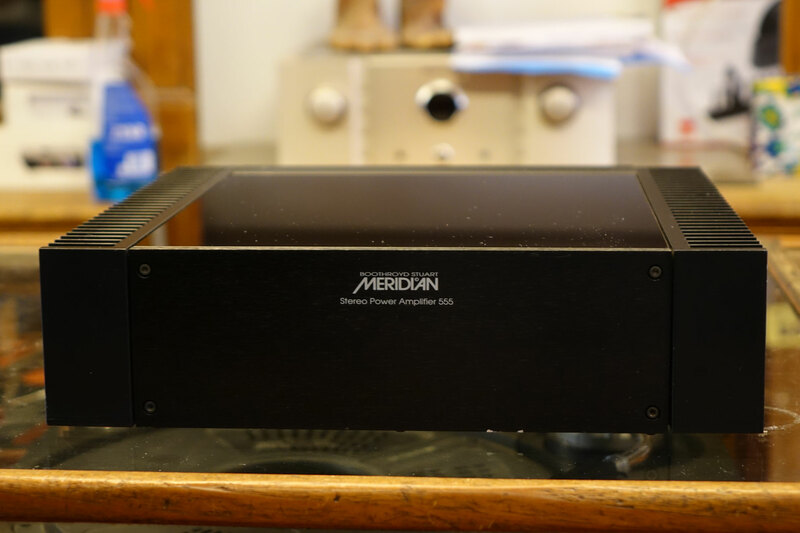 Great option for connecting analogue sources to your Meridian DSP-speakers. 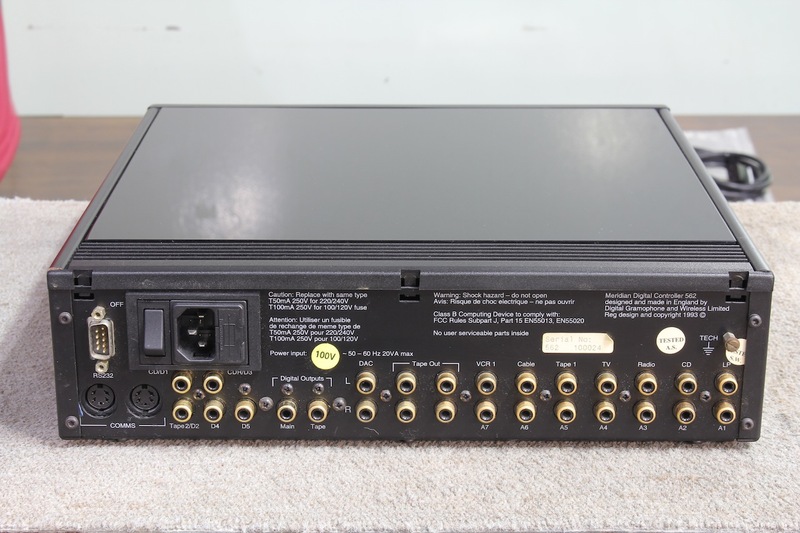 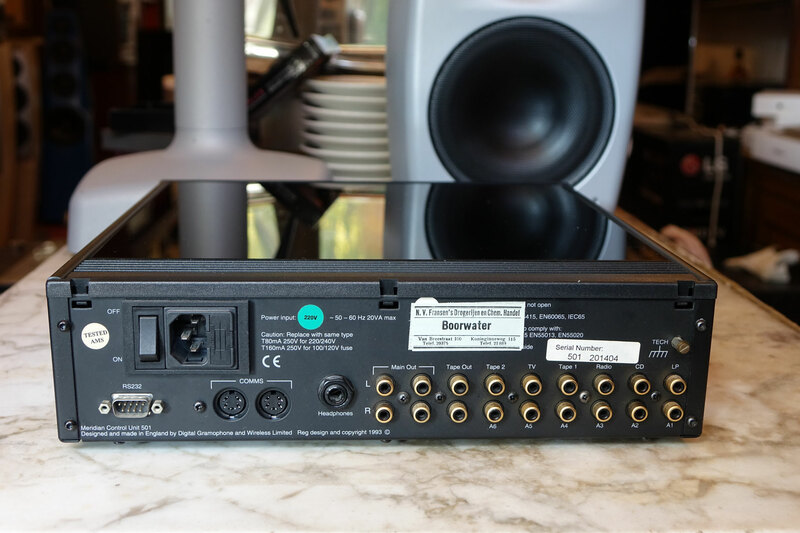 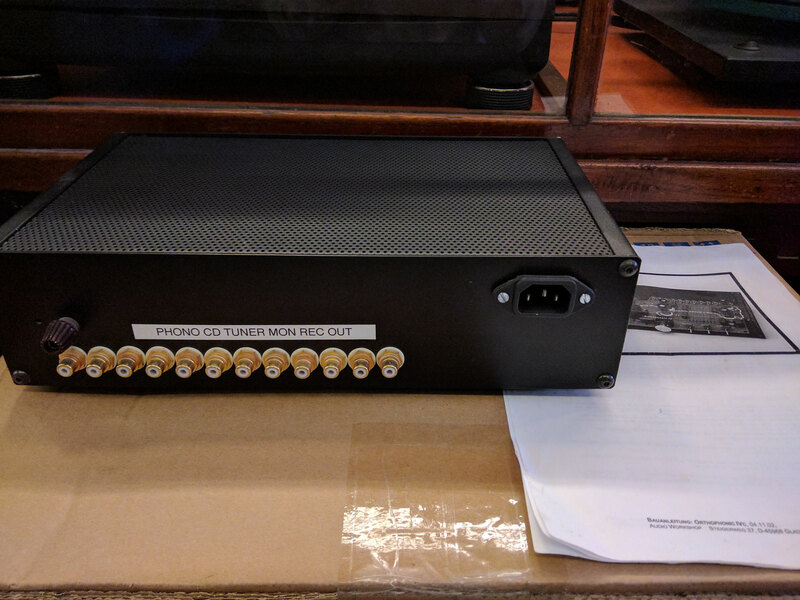 Pictures are from the web, but version/connections on rear-panel are identical to the sold unit. 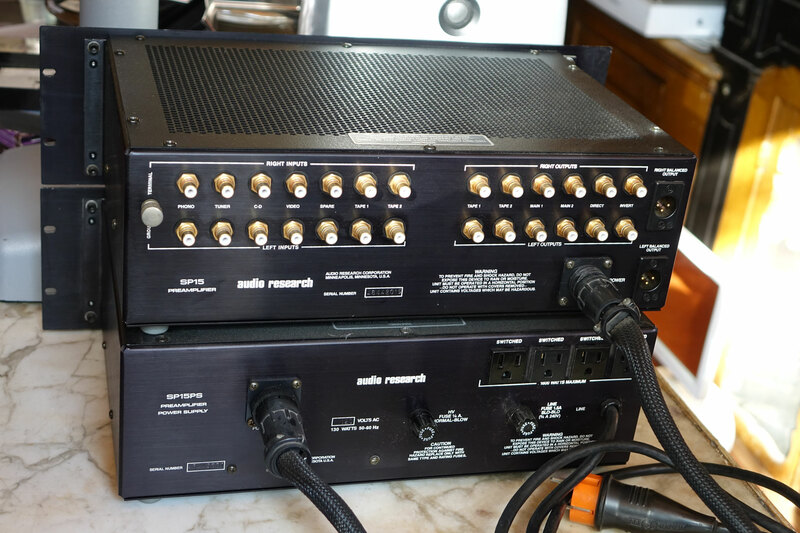 Accessories: Copie of manual, powercord, no matching MSR. A new MSR can be purchased at discount with this unit. 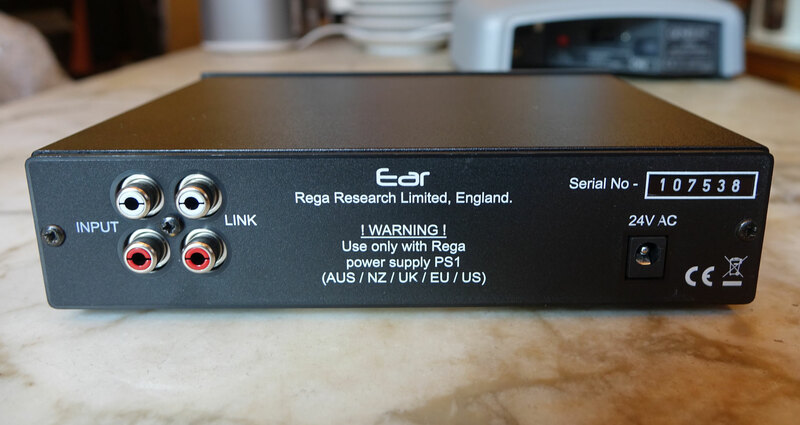 Inform by email about aquiring the individual components separately. 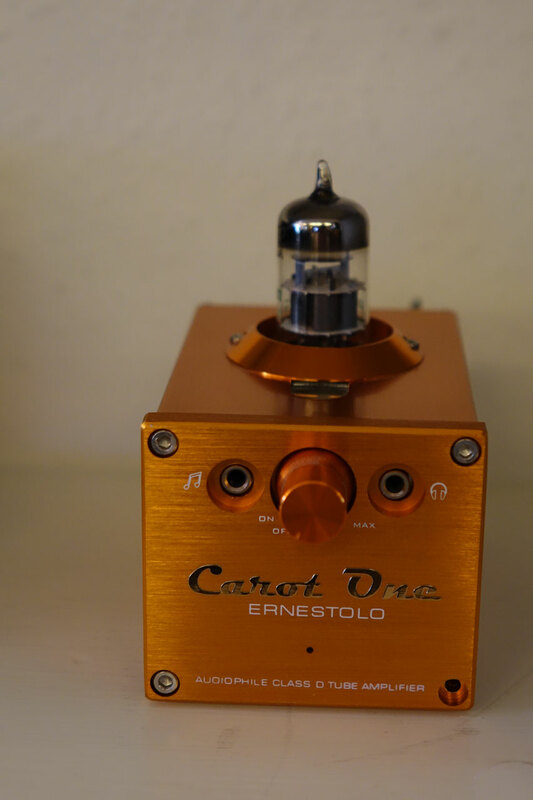 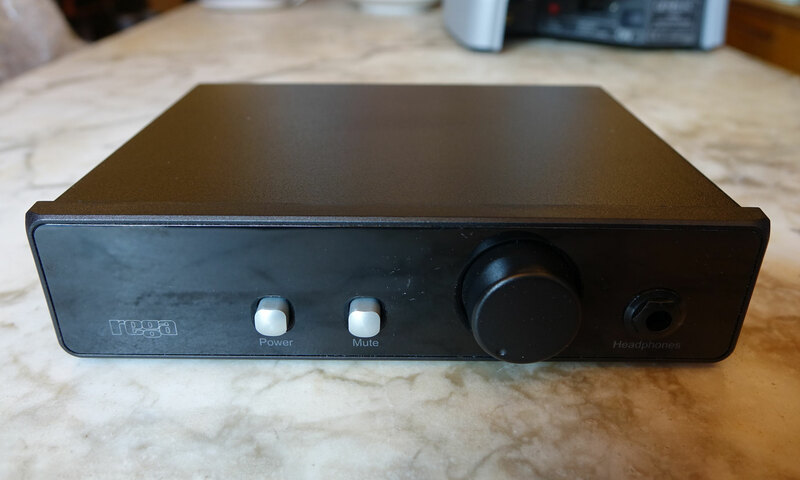 Description: Mini Integrated amplifier with tube pre and class D power stage. 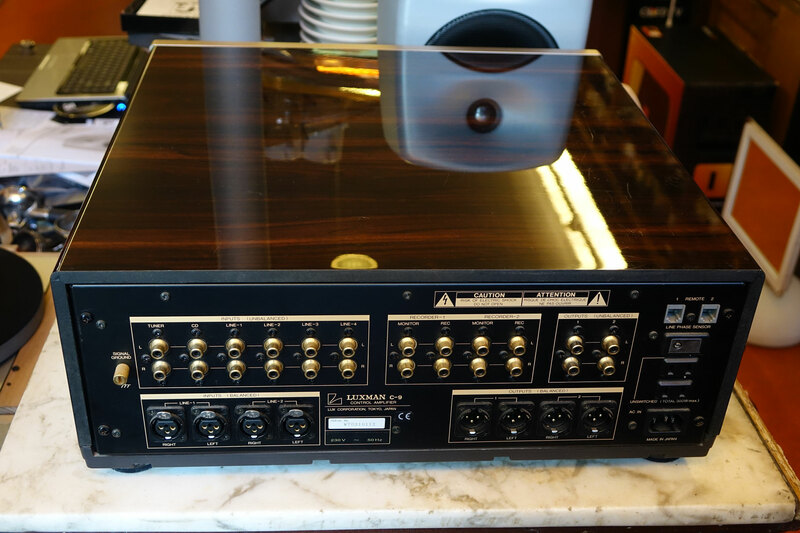 Accessories: All original, original packaging, power supplie(s) and manual. 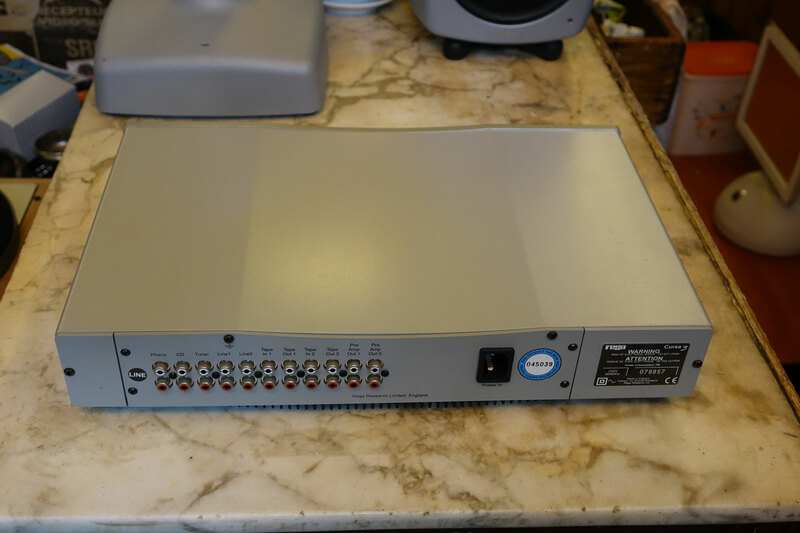 Description: Fully refurbished, including original manuals and folder. 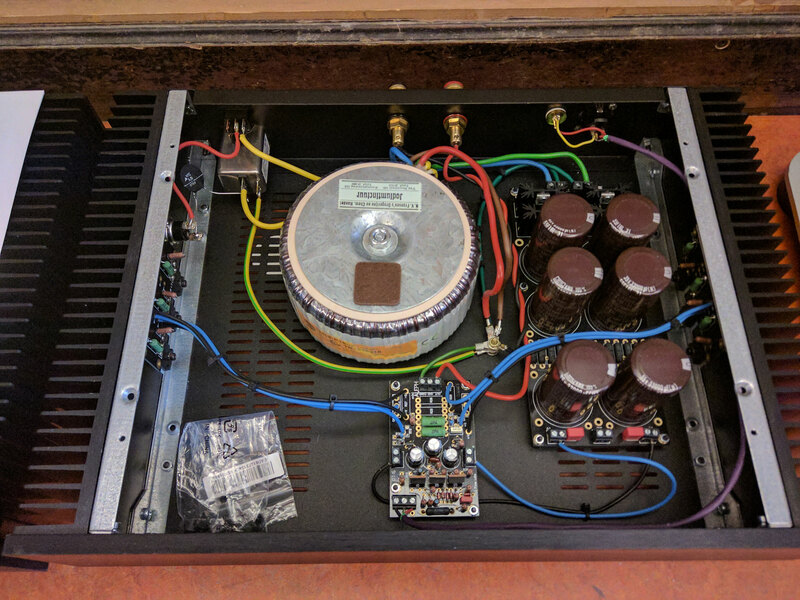 With Jensen caps and new 2x 12AU7A and 2x 12AX7WB tubes. 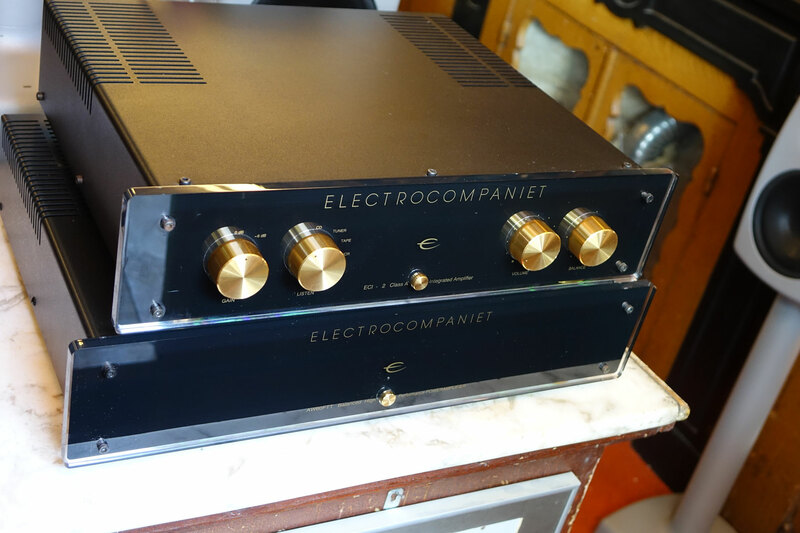 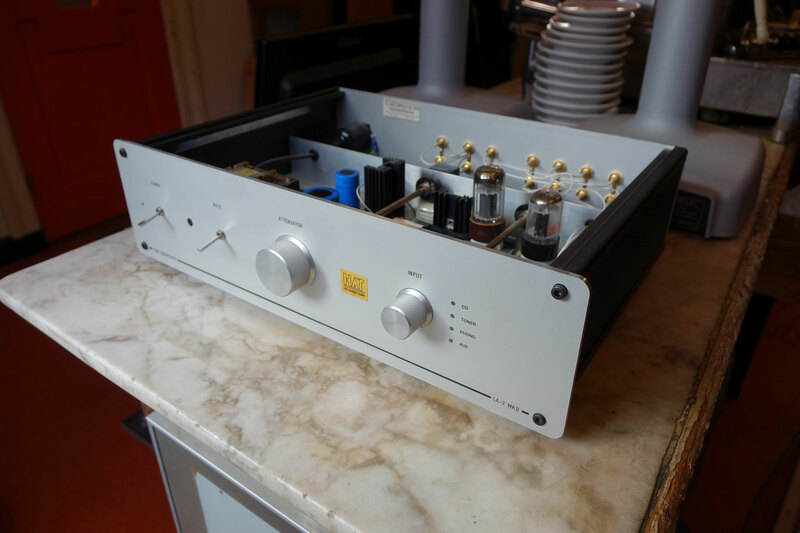 Fully refurbished (new, low esr elco's, and new tubes) and serviced.